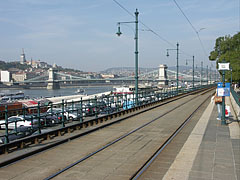 In the distance the white Elisabeth Bridge ("Erzsébet híd") can be seen. 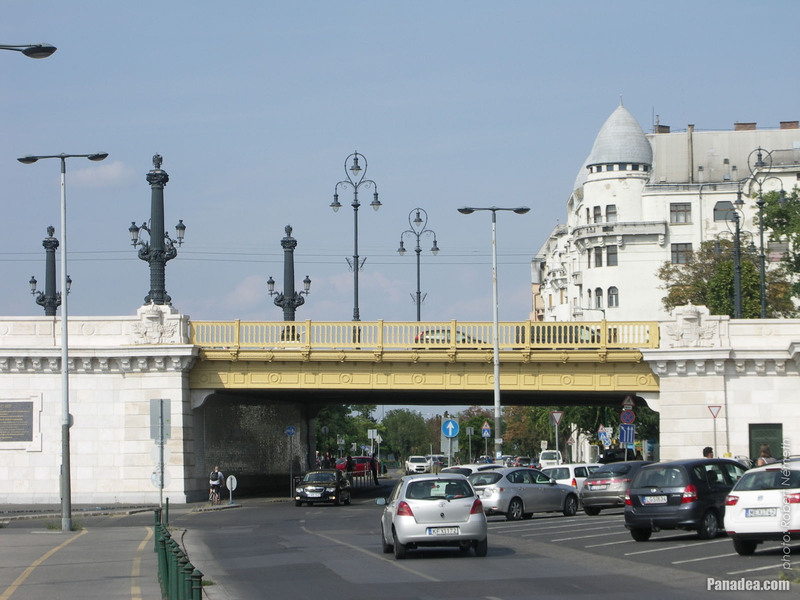 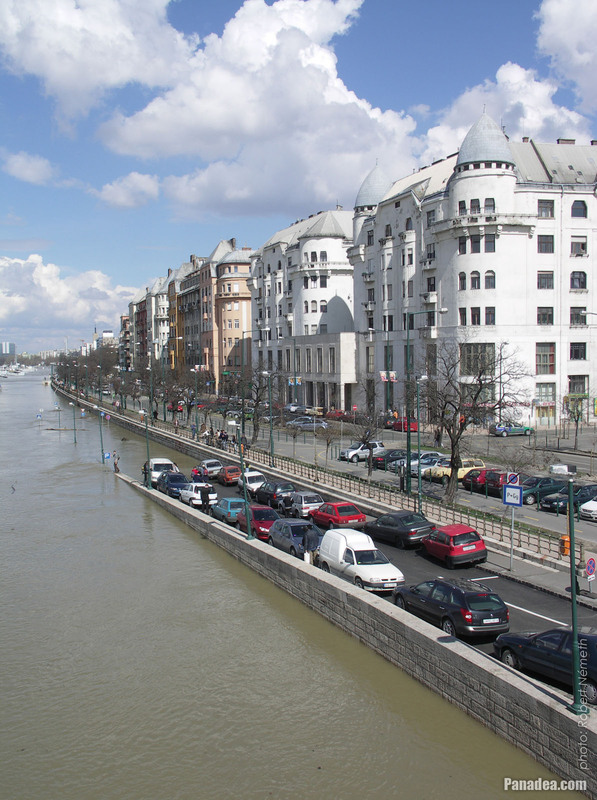 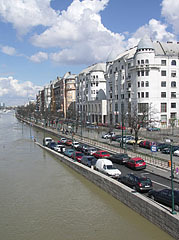 The building complex is situated at the foot of the Margaret Bridge ("Margit híd"), built between 1912-1913, architect: Emil Vidor. 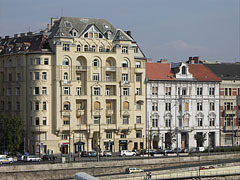 Built in 1911, architects: Jenő Svarcz and Antal Horváth. 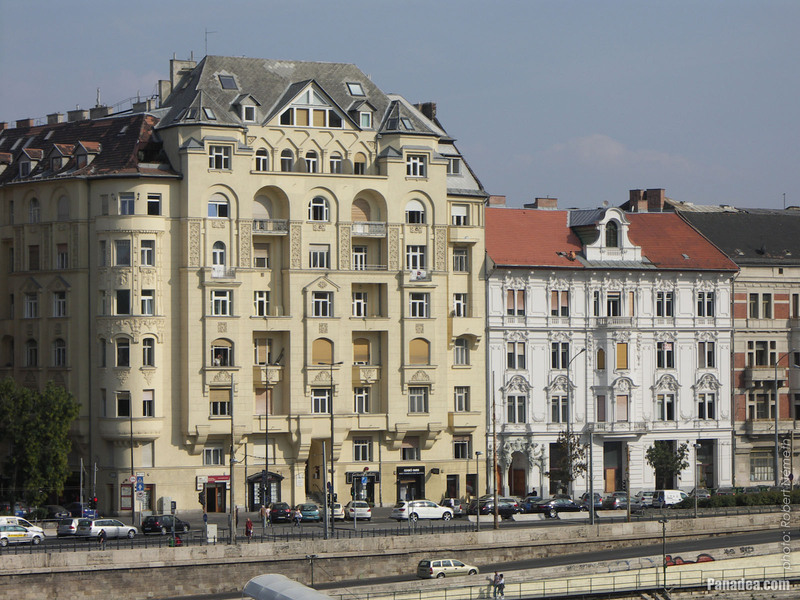 In addition the smaller, four-story residental building near it (at 25 Belgrád rakpart) is also worth to mention. 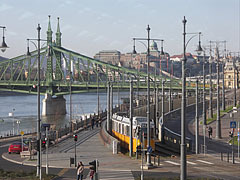 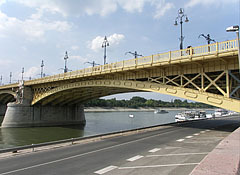 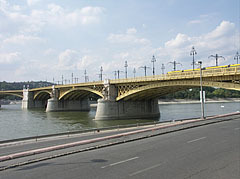 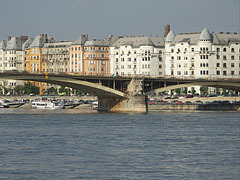 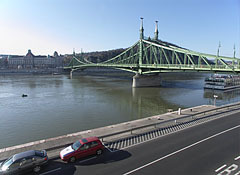 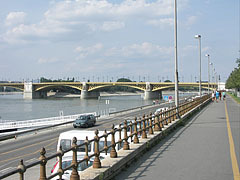 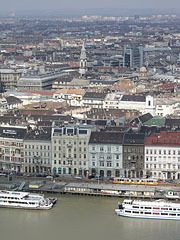 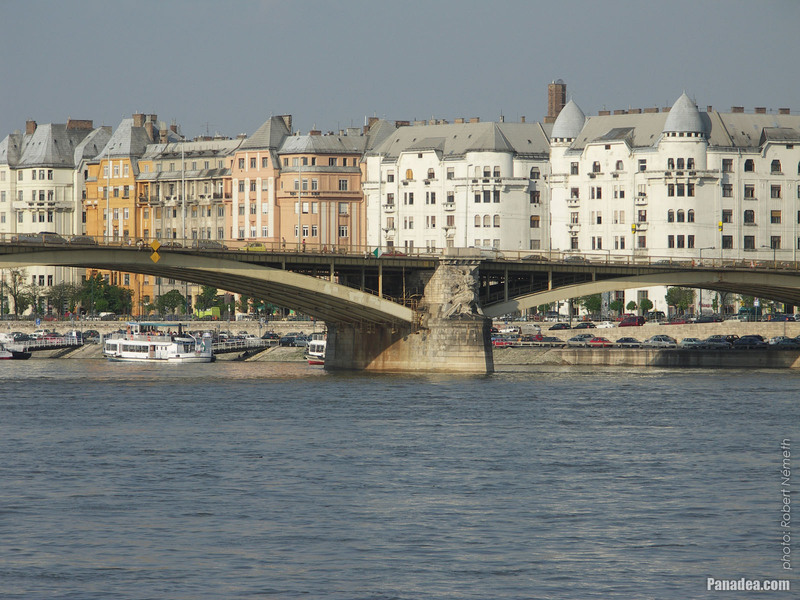 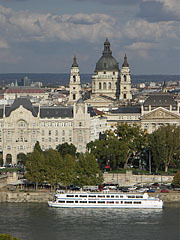 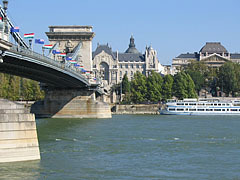 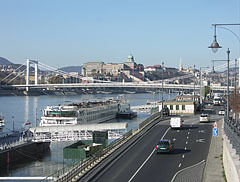 In the background the Széchenyi Chain Bridge ("Lánchíd") can be seen over River Danube. 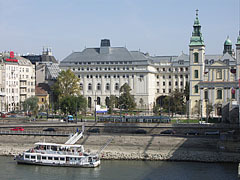 In the foreground the small tower-like structure belongs to the "Várkert-kioszk" ("Royal Garden Kiosk") building and in reality it was an ornate chimney. 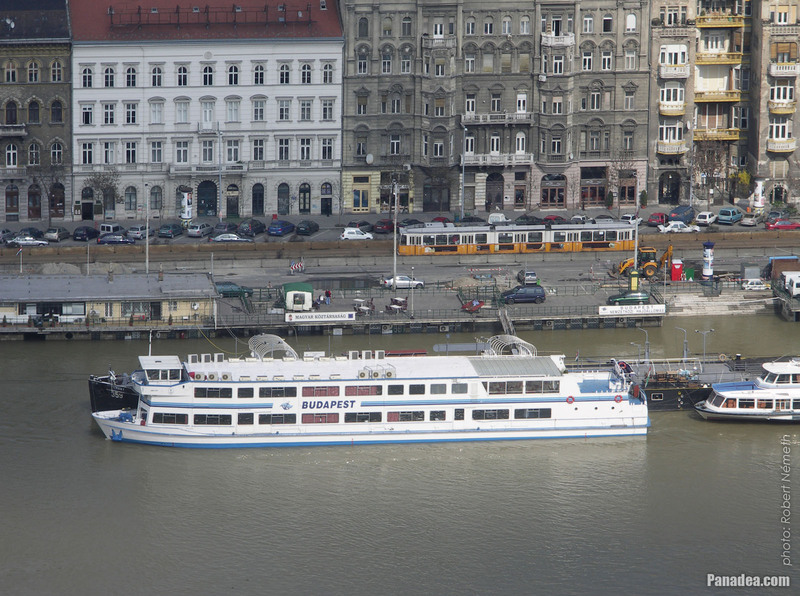 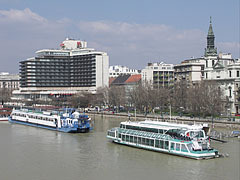 In front of the building on the river the "Győr" passenger riverboat can be seen. 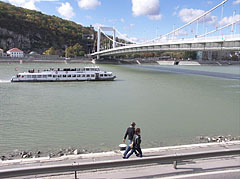 The 38-meter-long boat was constructed in 1982 in Moscow, Soviet Union, and it is operating on the Danube River in Hungary from the beginning. 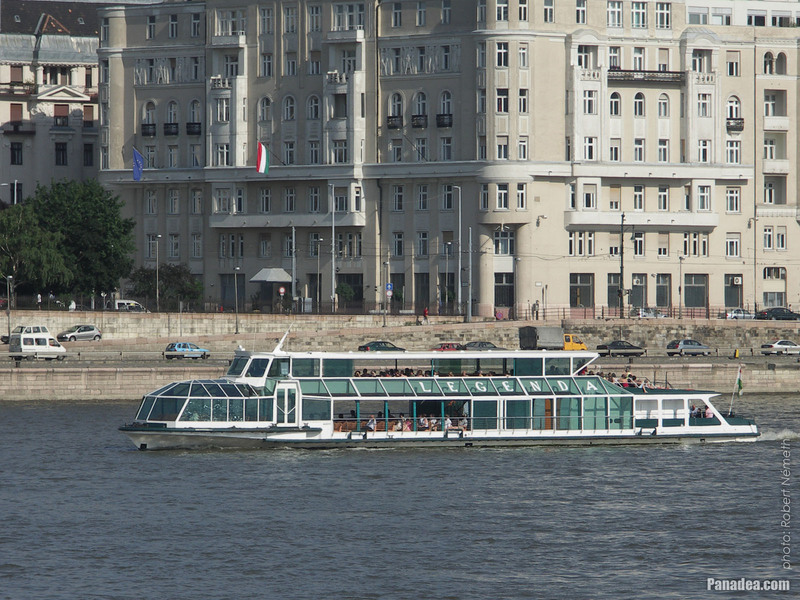 The 26-meter-long aluminium-hull riverboat or "water bus" was built in 1956 in Vác, Hungary, and has capacity of 150 persons. 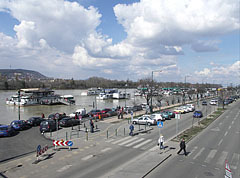 Initially it was called "Tihany" and was operated on Lake Balaton (at Siófok town), and later on the Danube, Körös and Tisza rivers as well. 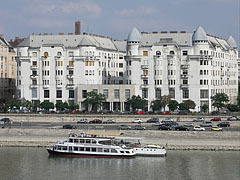 In 1989 it was completely remodeled and rebuilt. 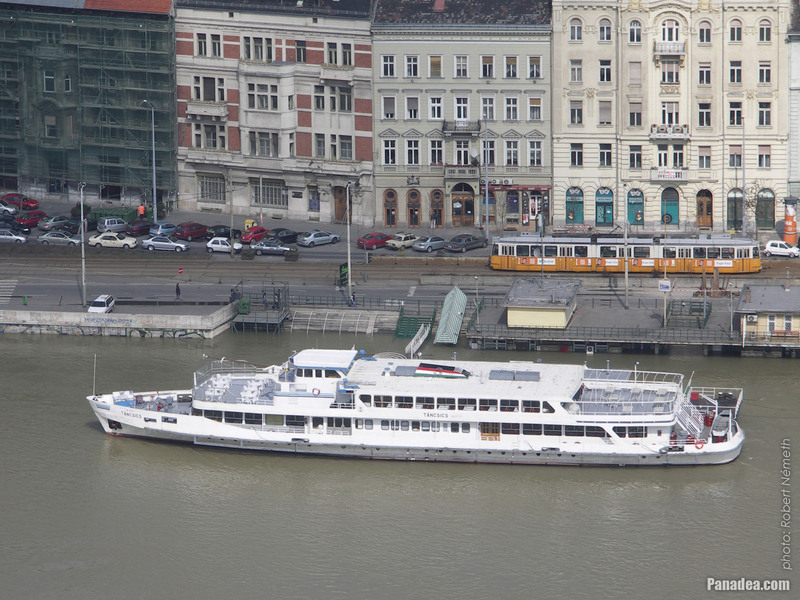 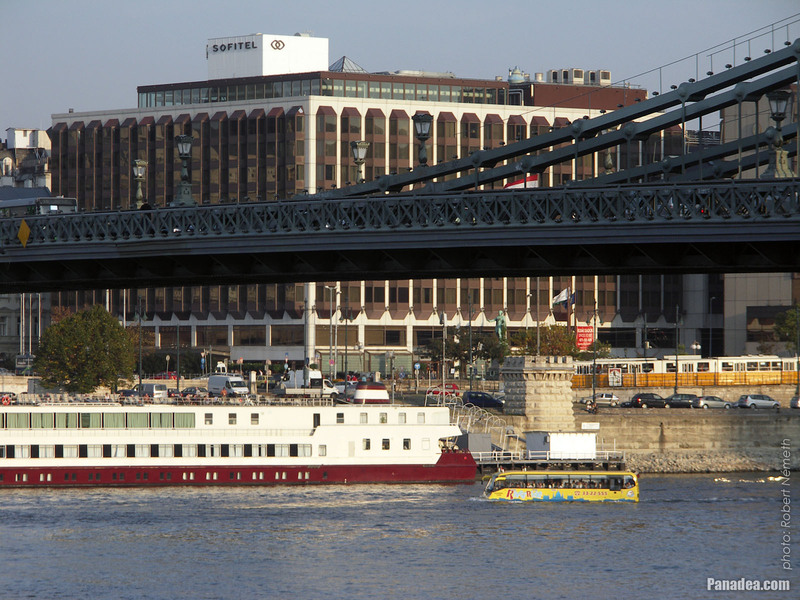 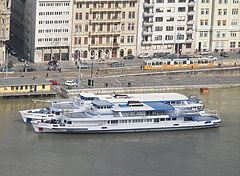 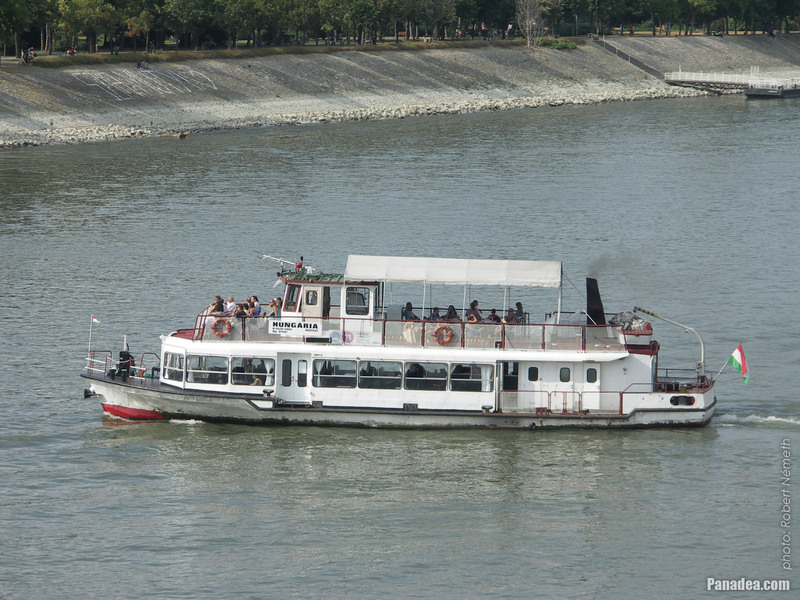 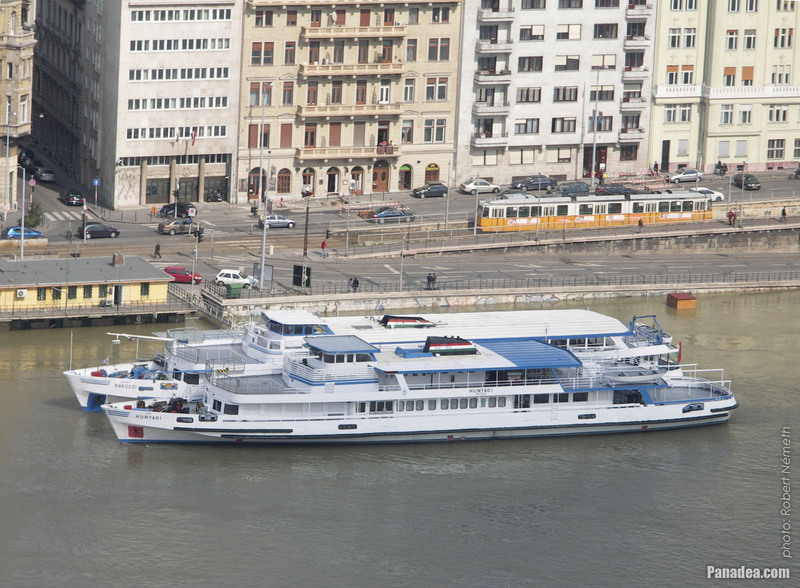 From 1991 to ten years it was called "Hegyalja", and since 2001 it is operated on the Danube River again. 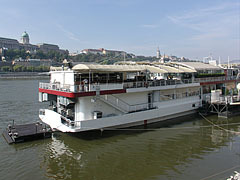 The small, just 24-meter long riverboat was constructed in Balatonfüred, Hungary in 1984. 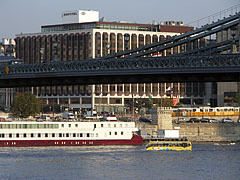 The 38-meter-long riverboat was originally made in Moscow, Soviet Union (today Russia) in 1976. 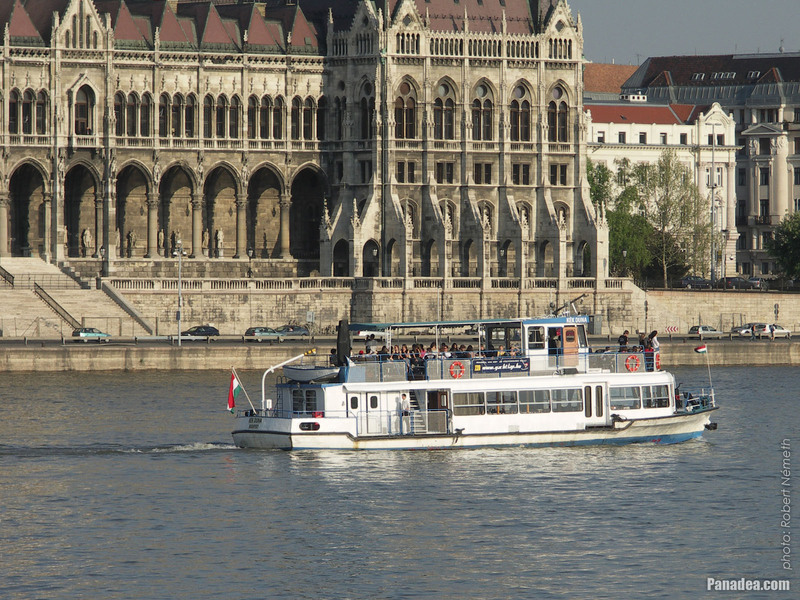 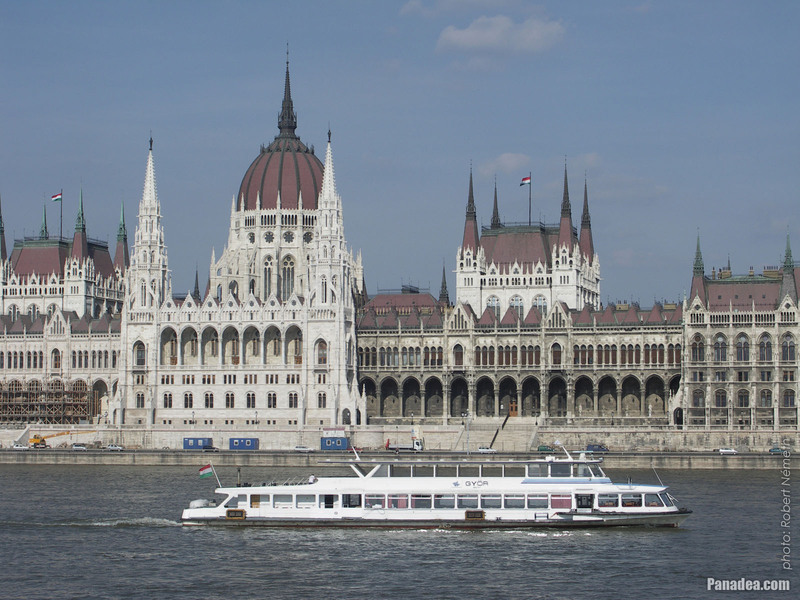 It was moved to Hungary in 2002, then the boat was completely remodeled and received the current "all-glass" superstructure and became a sightseeing boat. 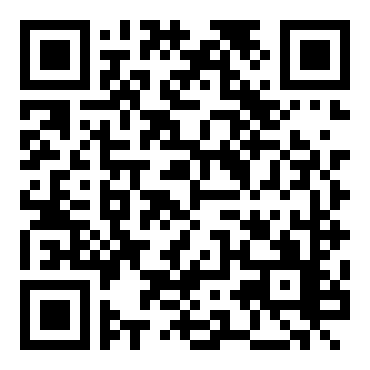 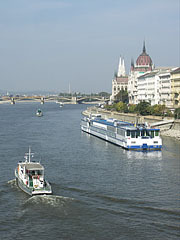 Moreover, it received its current name immediately after that, more precisely in 2004. 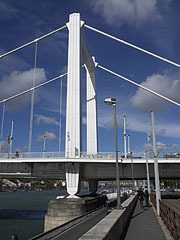 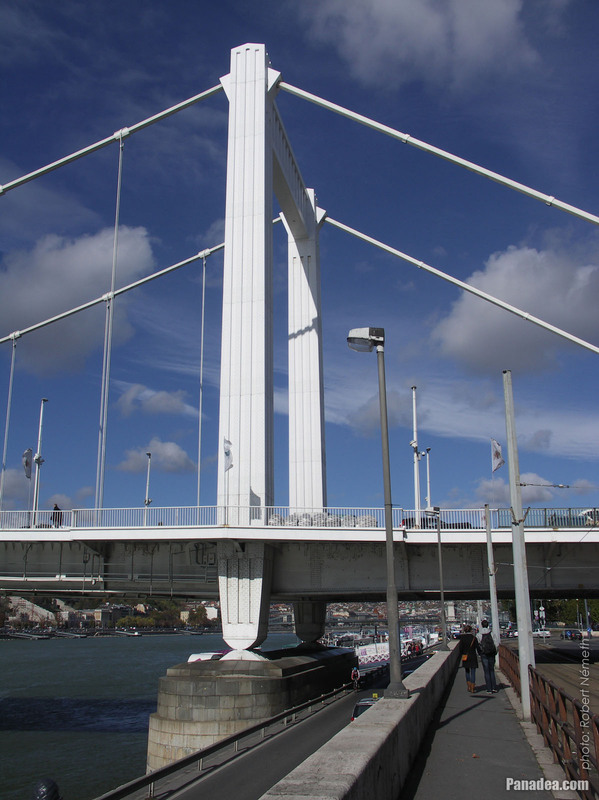 The pier is the upright support under the carriageway of the bridge, while the pylon (tower) structure is above it. 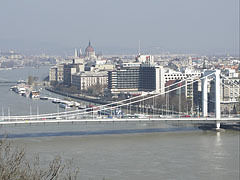 The Elizabeth Bridge is a suspension bridge so that's why it has both. 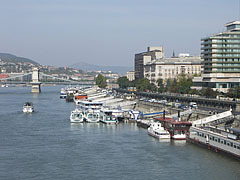 On the other side of the river the Gellért Hill cliff can be seen. 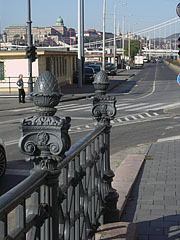 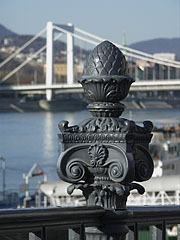 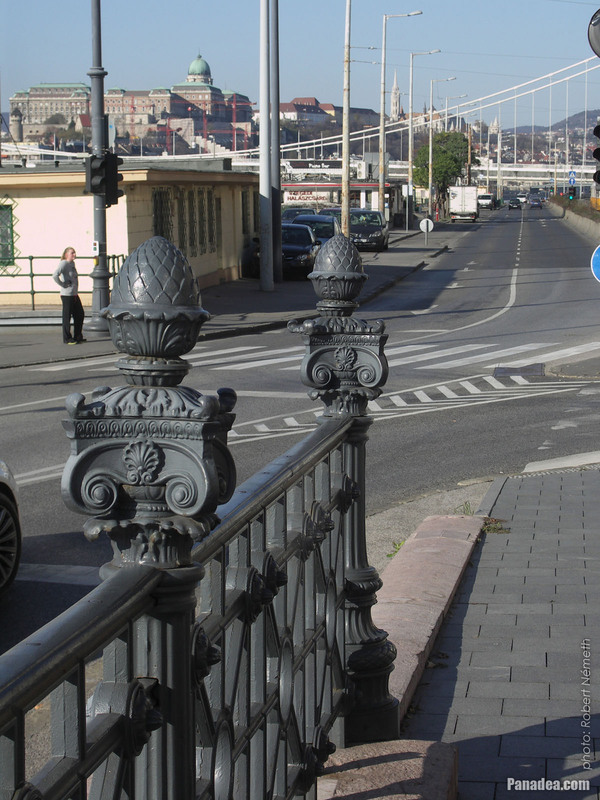 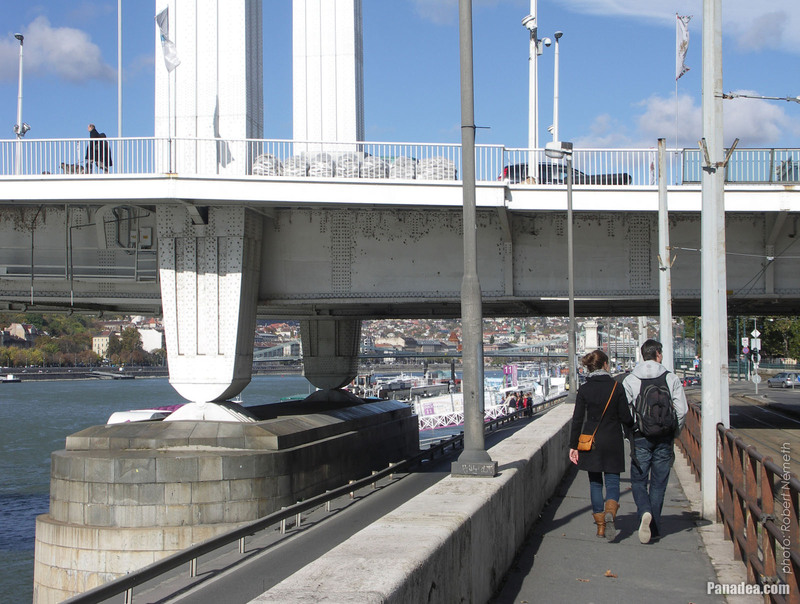 Just to mention, it is the so-called "Ybl railing" that is named after the 19th-century Hungarian architect Miklós Ybl. 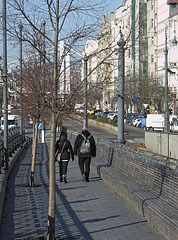 It can be found in many places in the city. 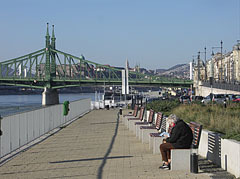 In the background of the picture the Elisabeth Bridge can be seen as well. 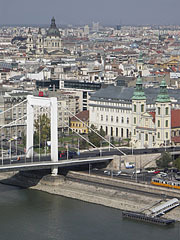 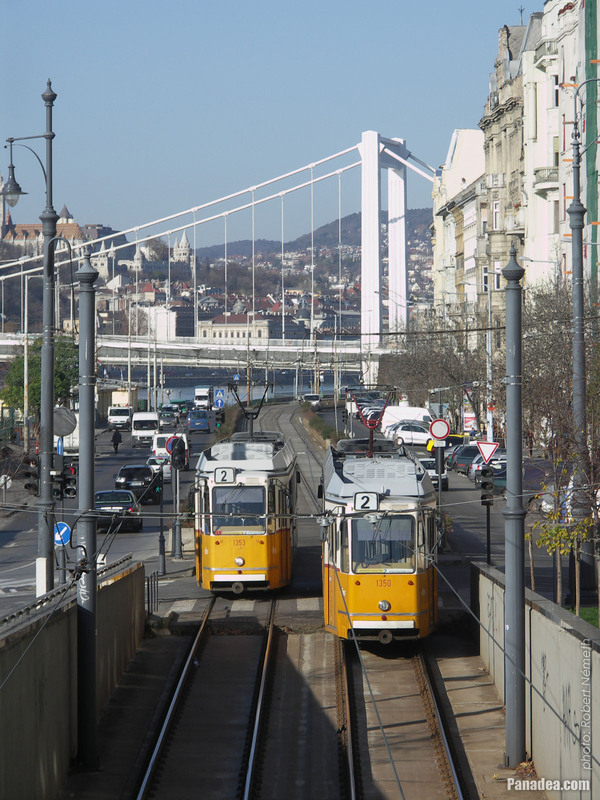 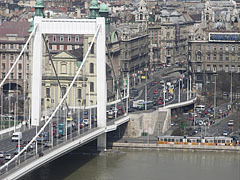 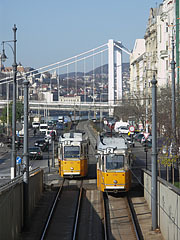 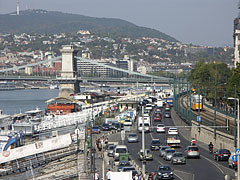 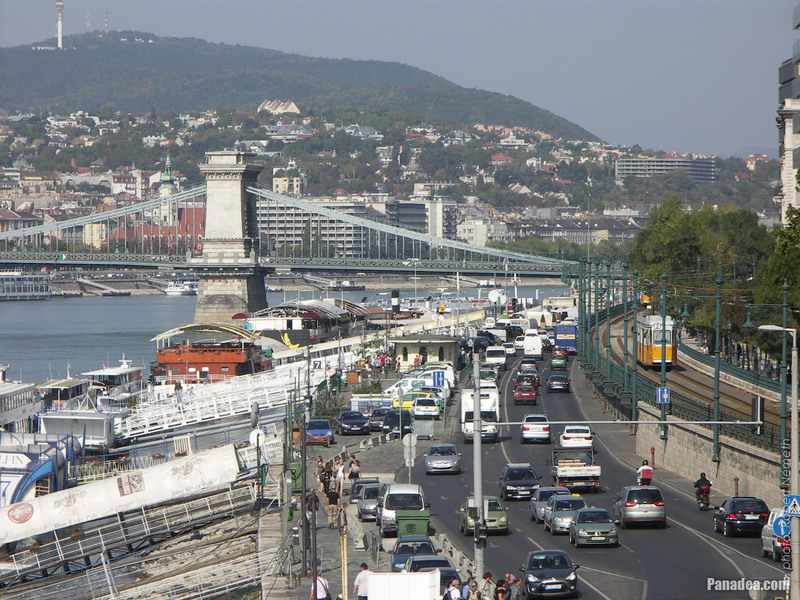 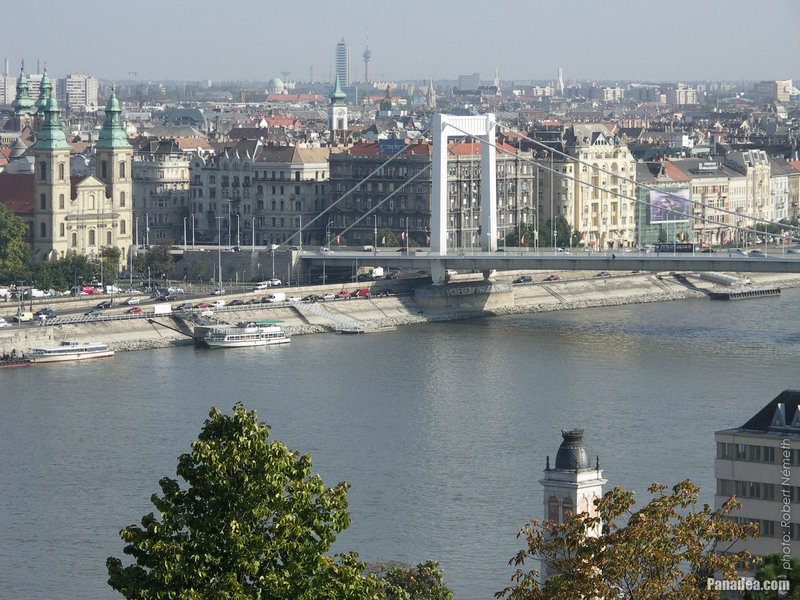 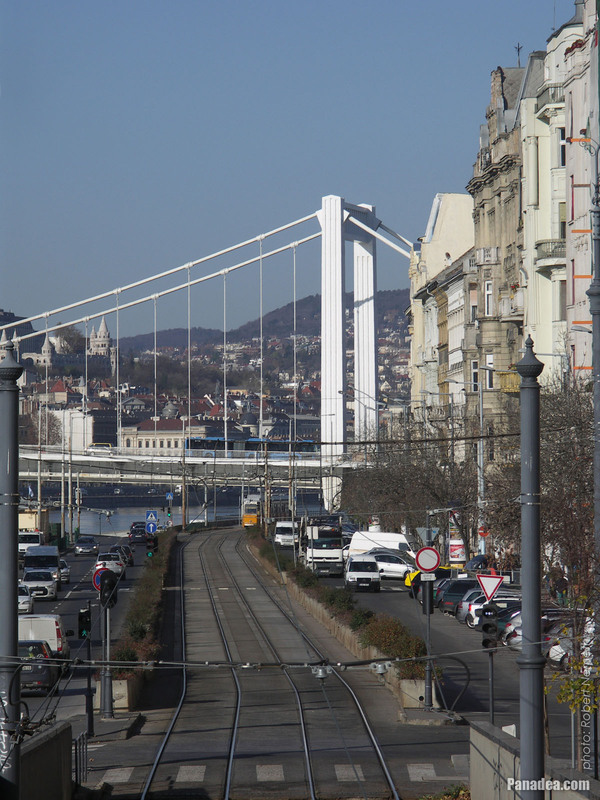 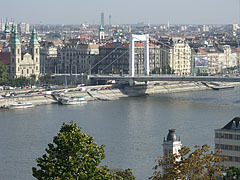 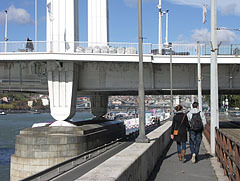 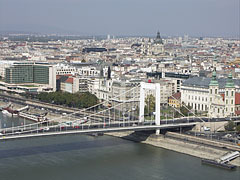 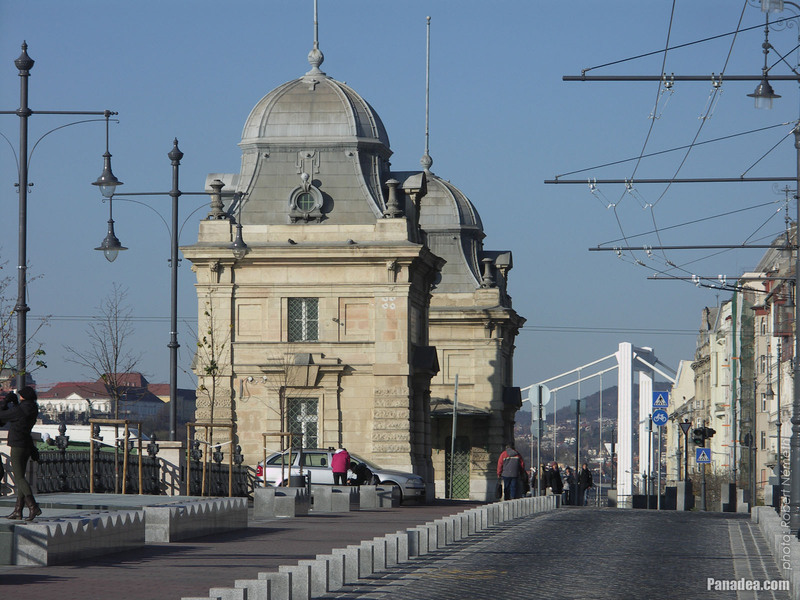 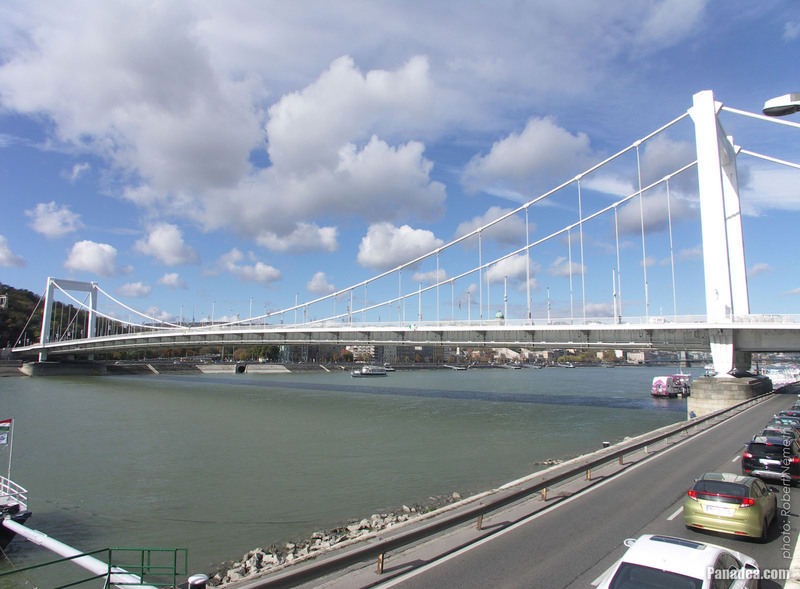 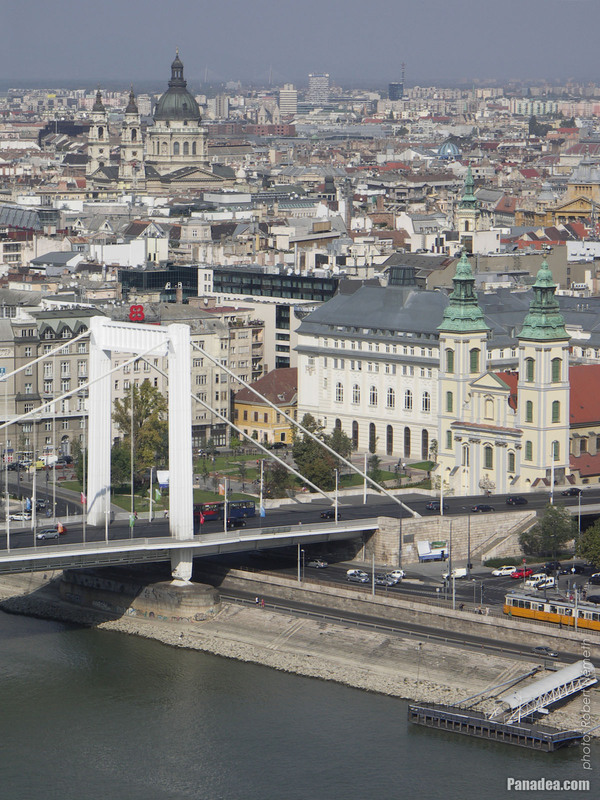 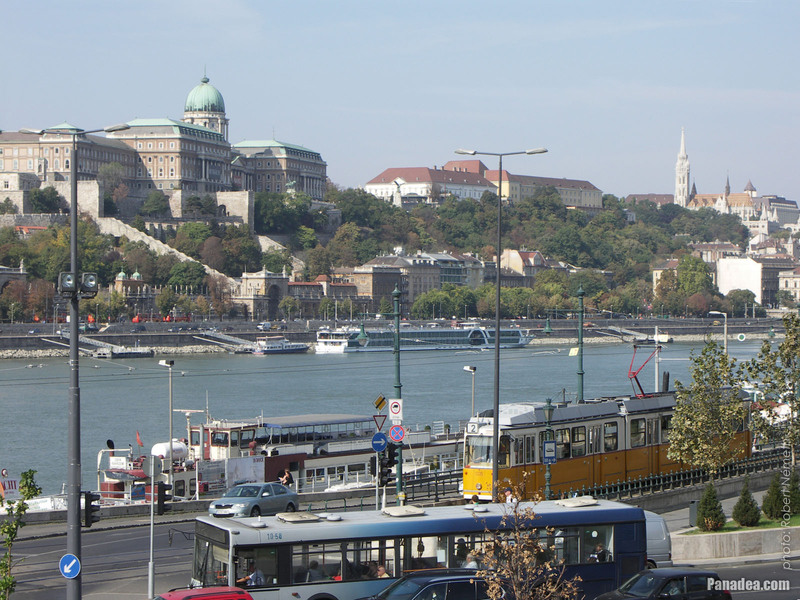 The Elisabeth Bridge ("Erzsébet híd") and the Buda castle Quarter are also well visible. 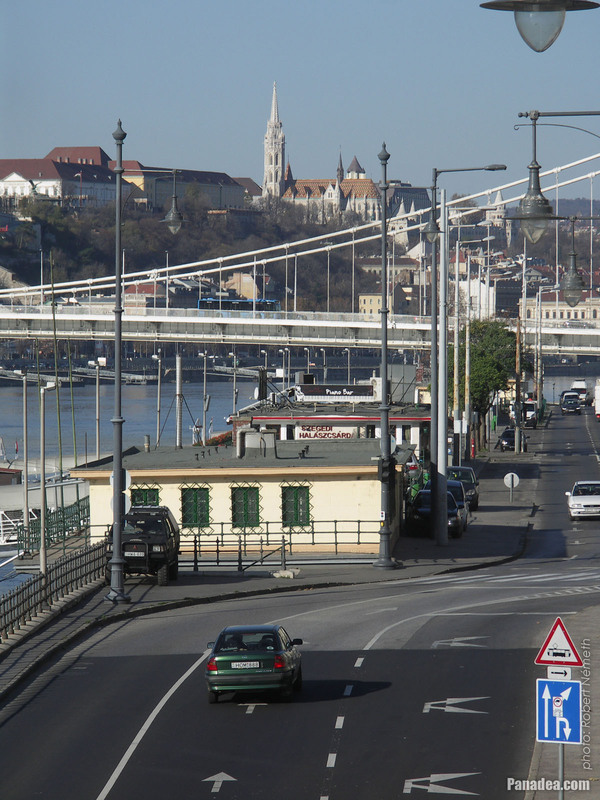 In the distance the Matthias Church is towering in the Buda Castle. 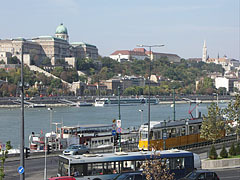 Far away the Elisabeth Bridge ("Erzsébet híd") and the Buda Castle can be seen. 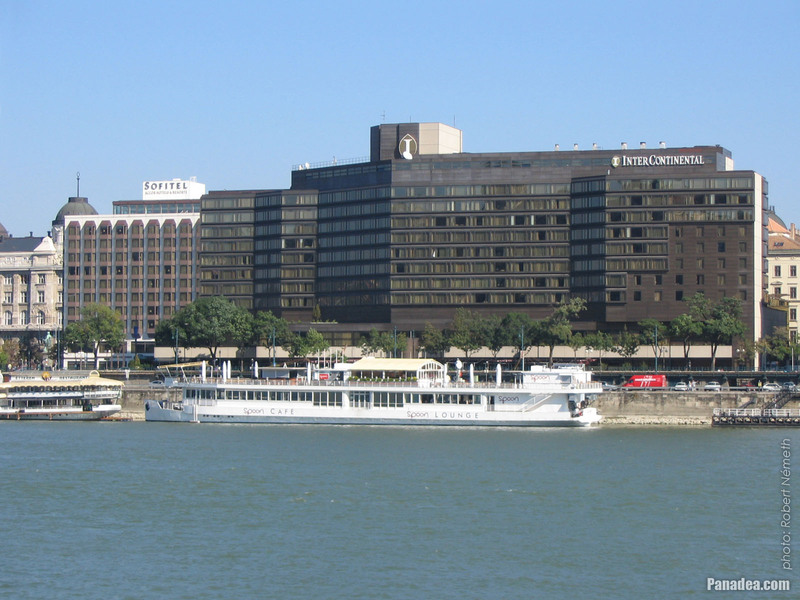 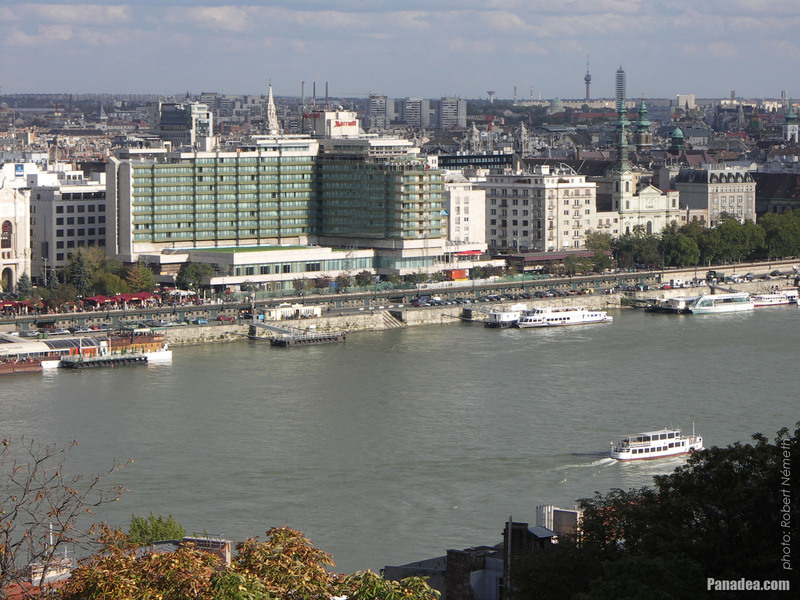 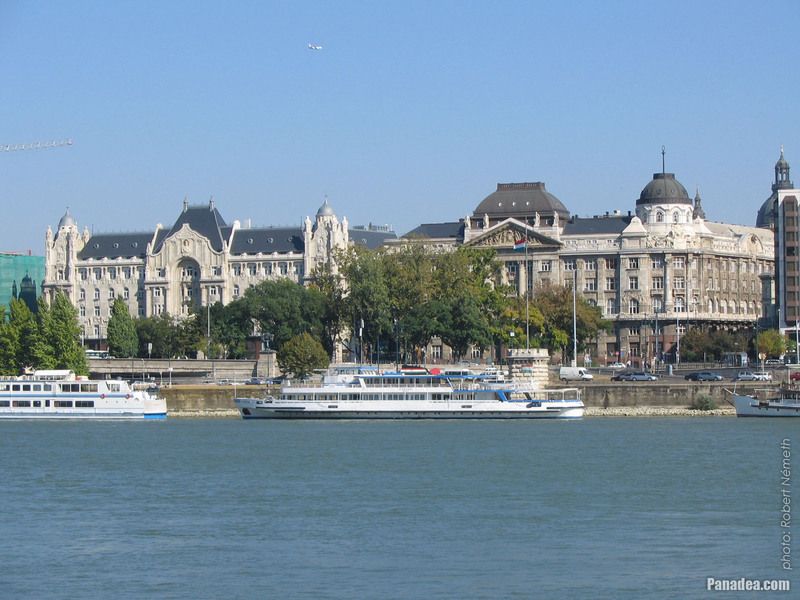 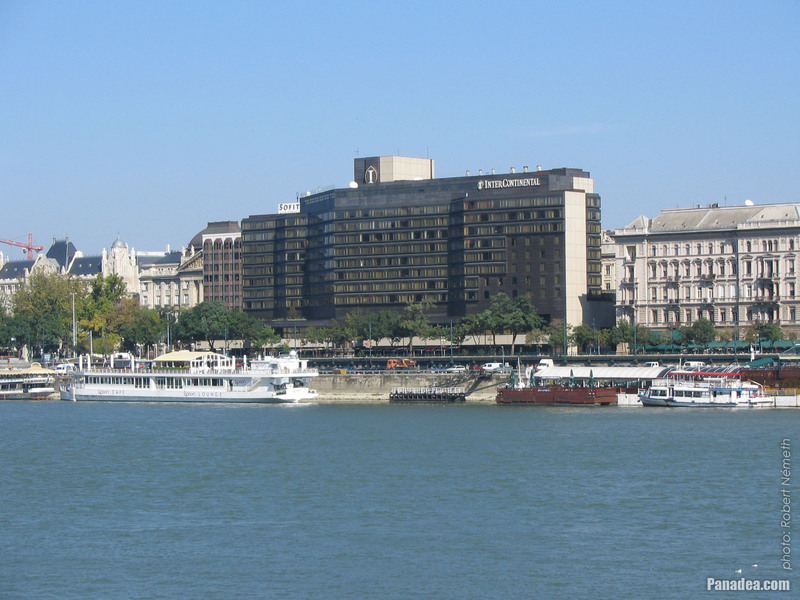 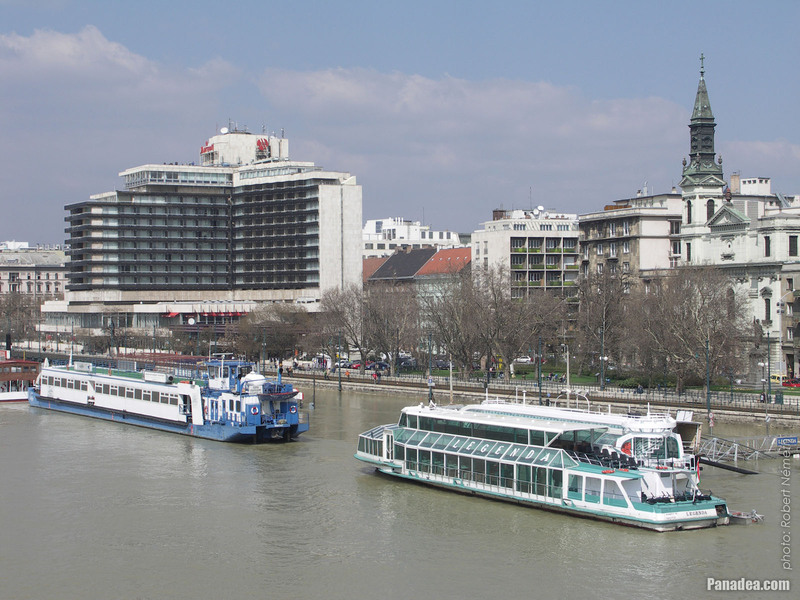 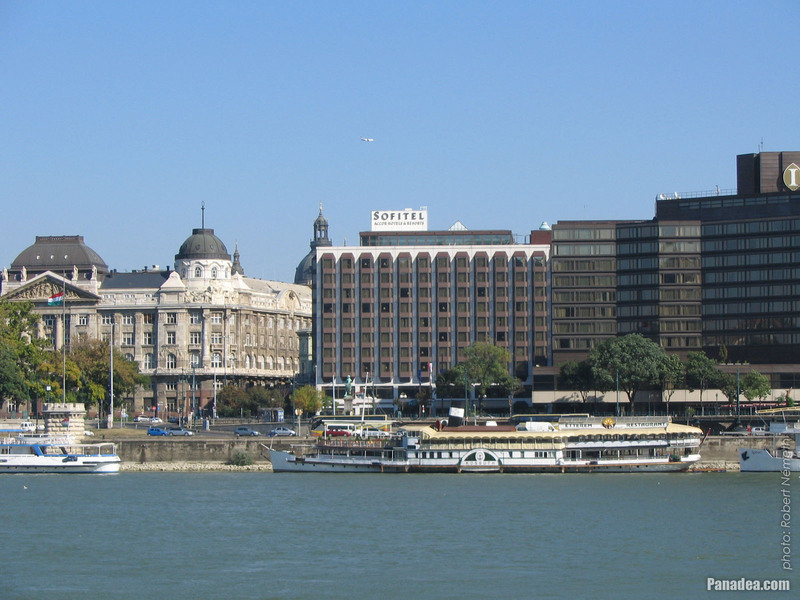 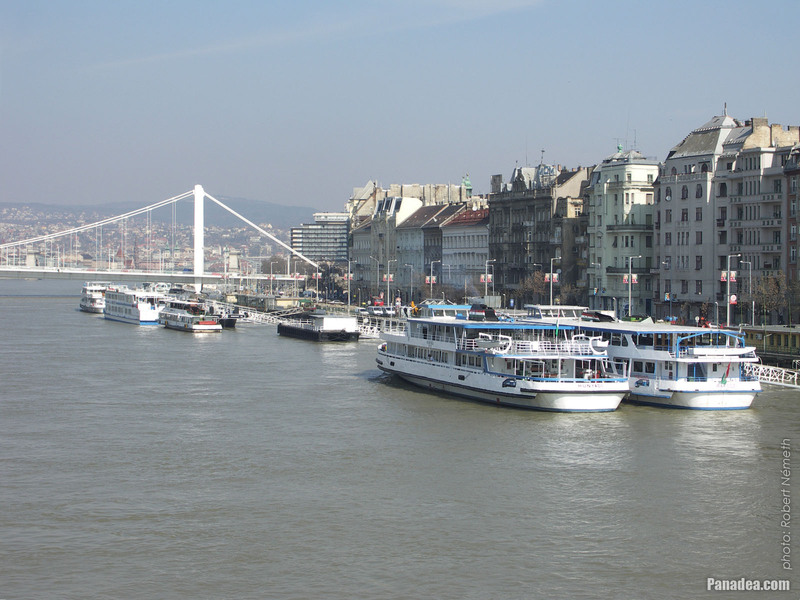 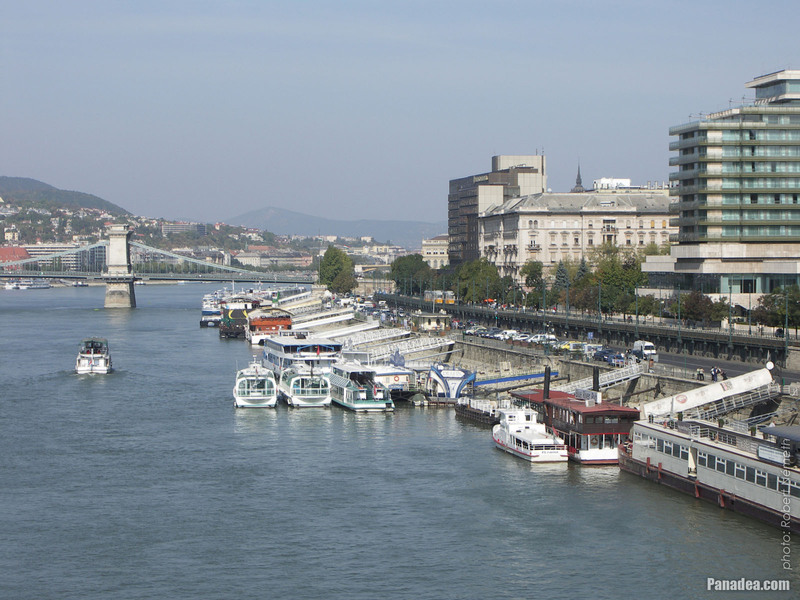 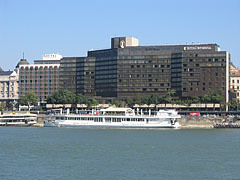 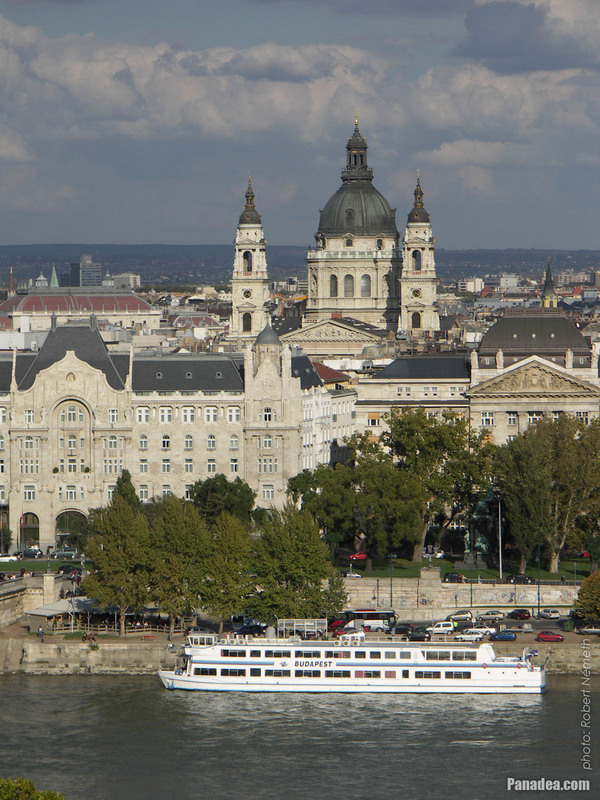 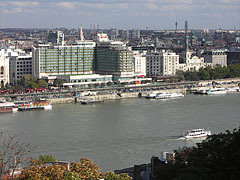 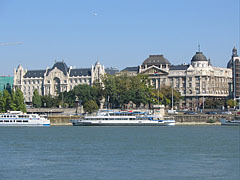 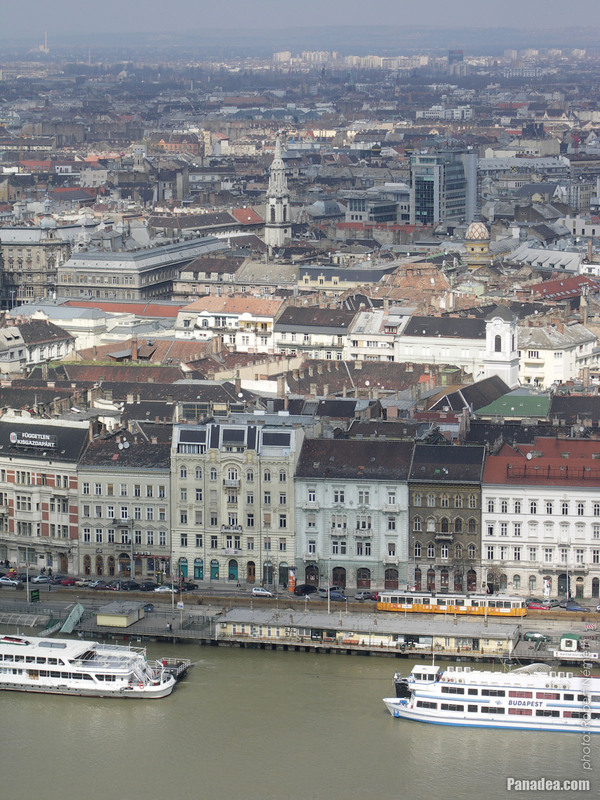 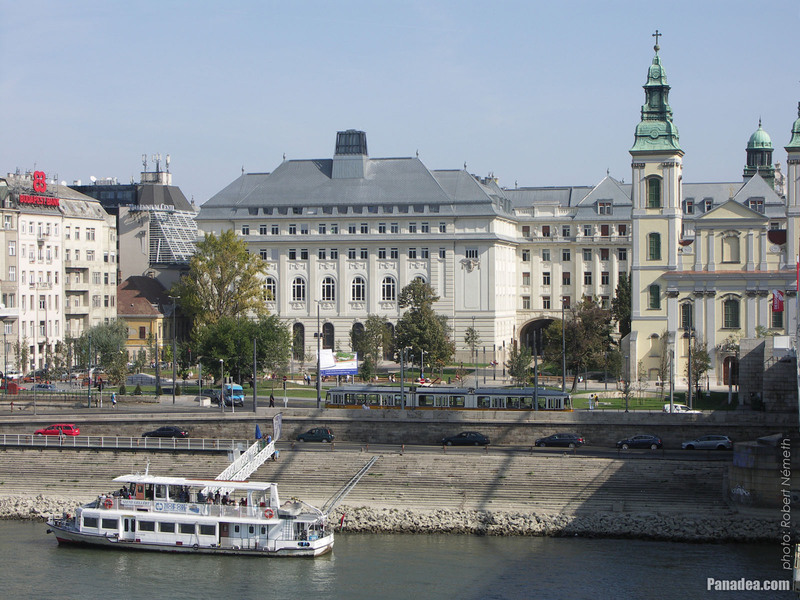 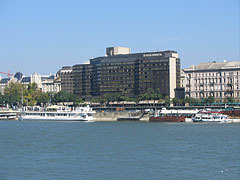 On the left on the other side of the river the Hotel Gellért can be seen. 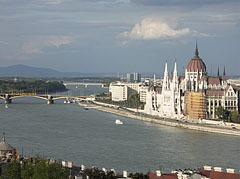 In addition some distance away the Danube River and the Margaret Island can be seen. 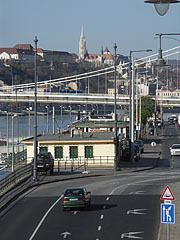 Újlipótváros is a neighbourhood in the 13th district of Budapest. 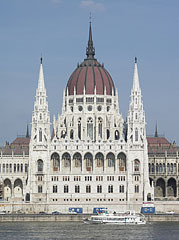 The Calvinist Church on the Pozsonyi Road ("Thanksgiving Church" or "Hálaadás templom") was built between 1937-1940 by the plans of Imre Tóth and Jenő Halász. 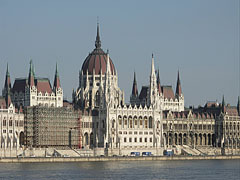 It was highly damaged in the World War II and the reconstruction works was completed only in 1987. 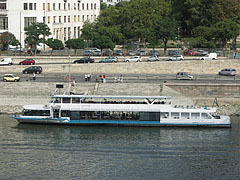 The powered boat was constructed in Moscow, Soviet Union in the 1980s and initially it was called "Tigina 2". 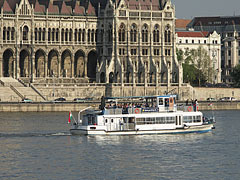 It was brought to Hungary in 1995, the former names were "Szent István" and "Csárdás" (and "Sailor" since 2009). On the left the Margaret Island ("Margit-sziget"), as well as in the distance the Árpád Bridge ("Árpád híd") can be seen. 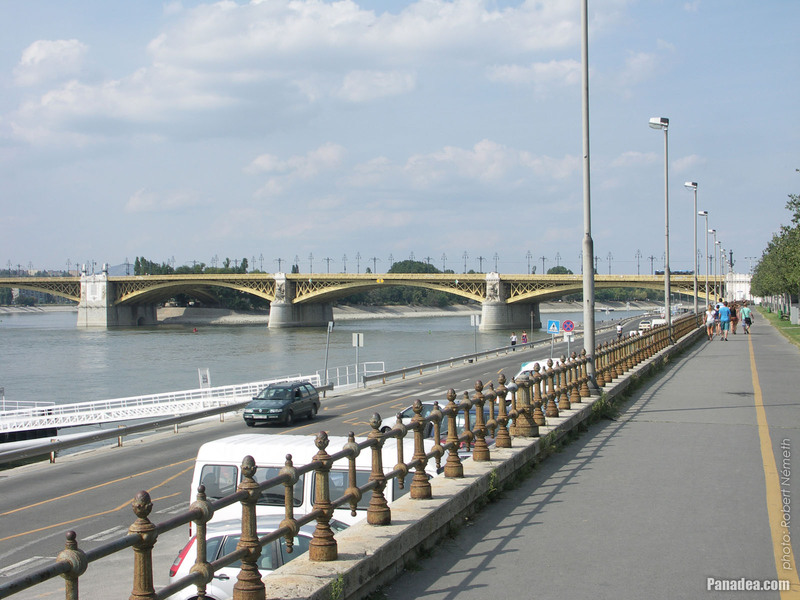 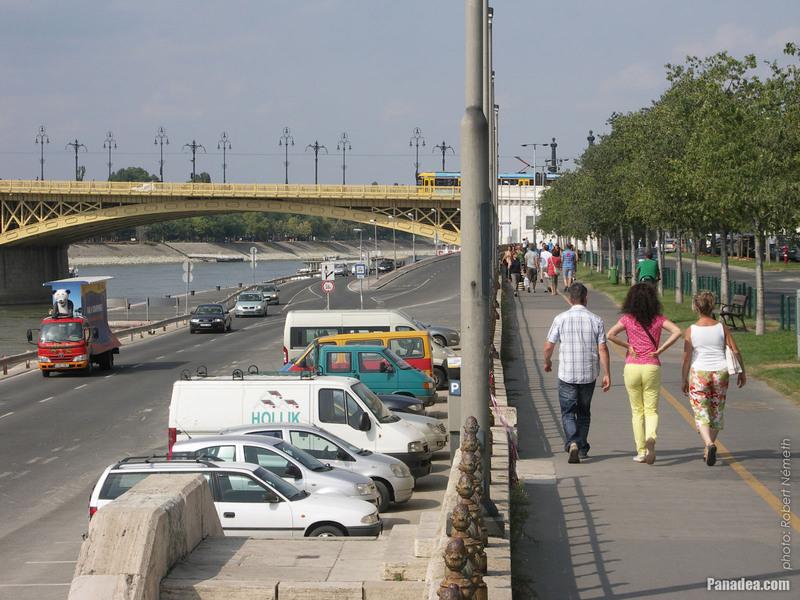 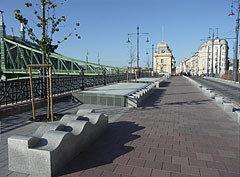 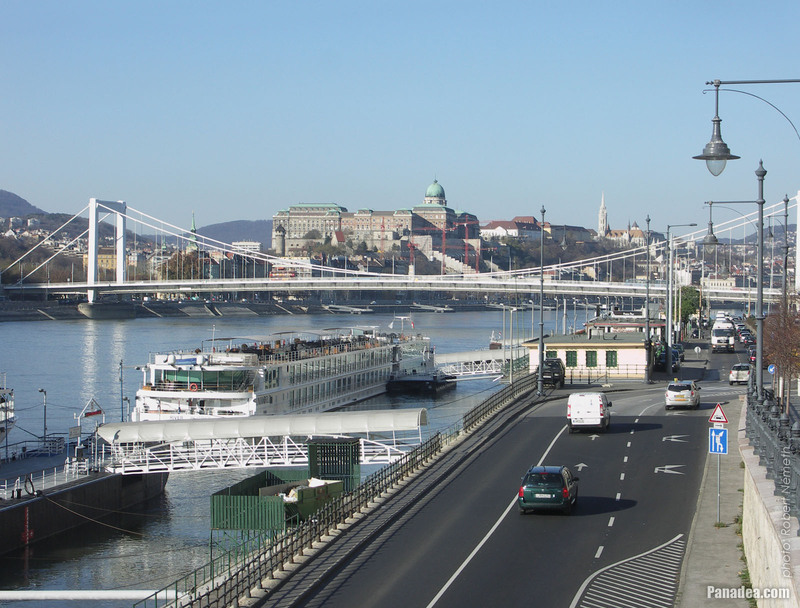 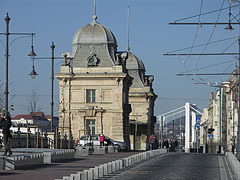 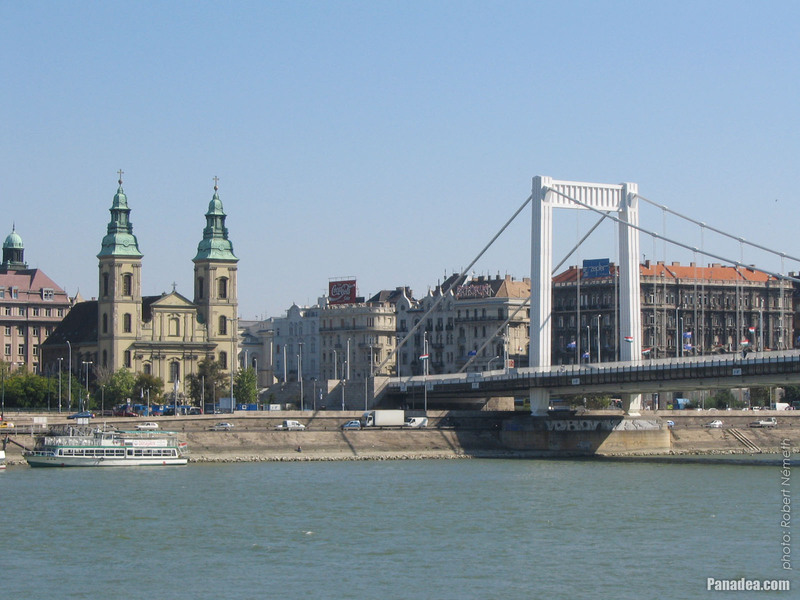 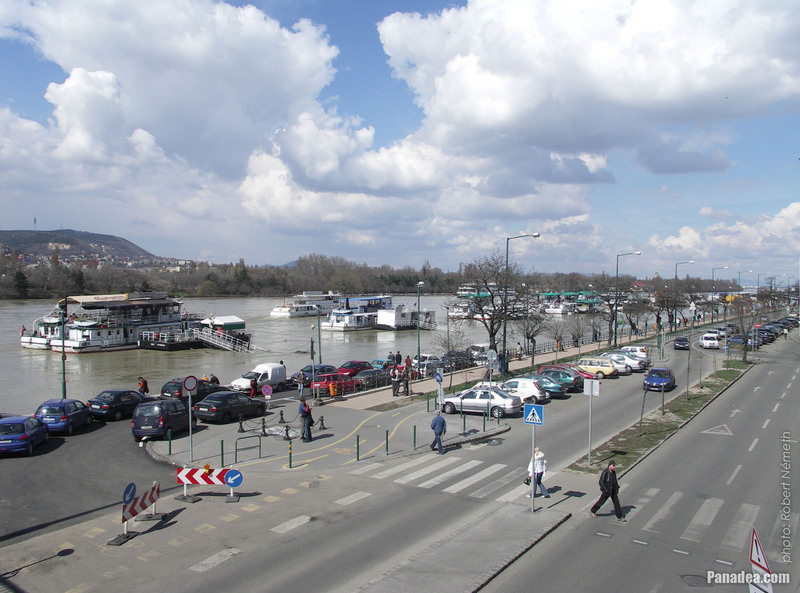 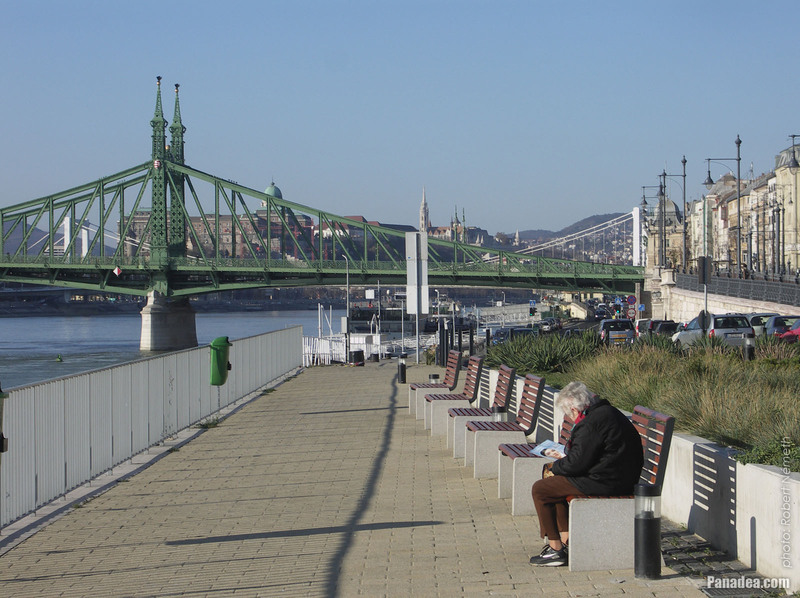 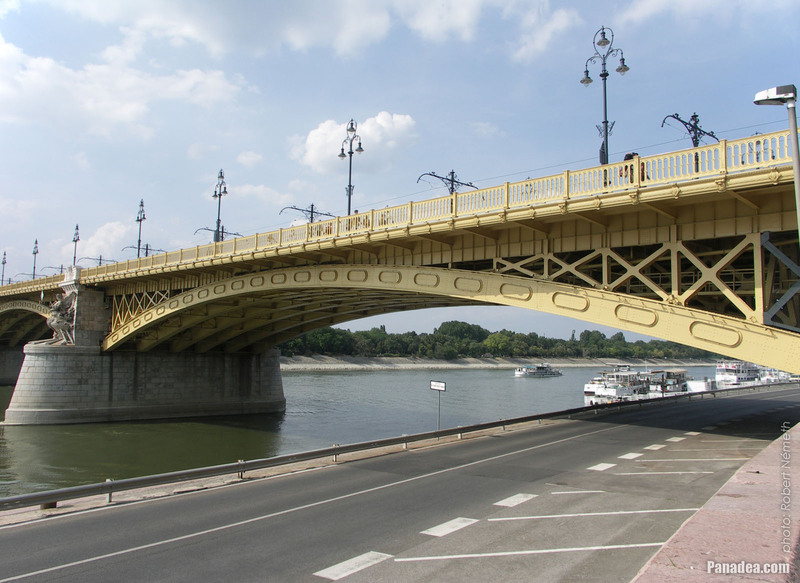 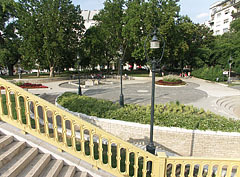 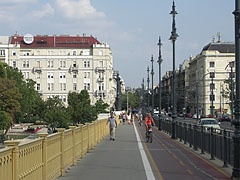 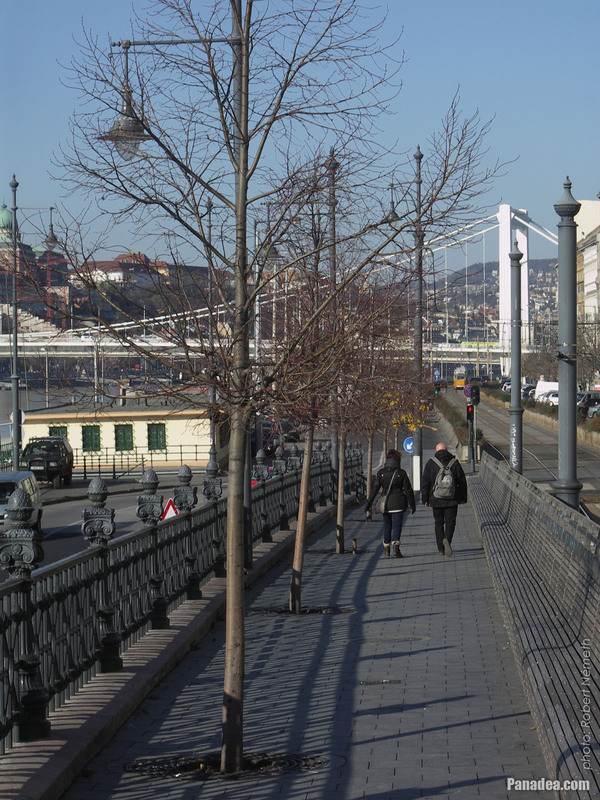 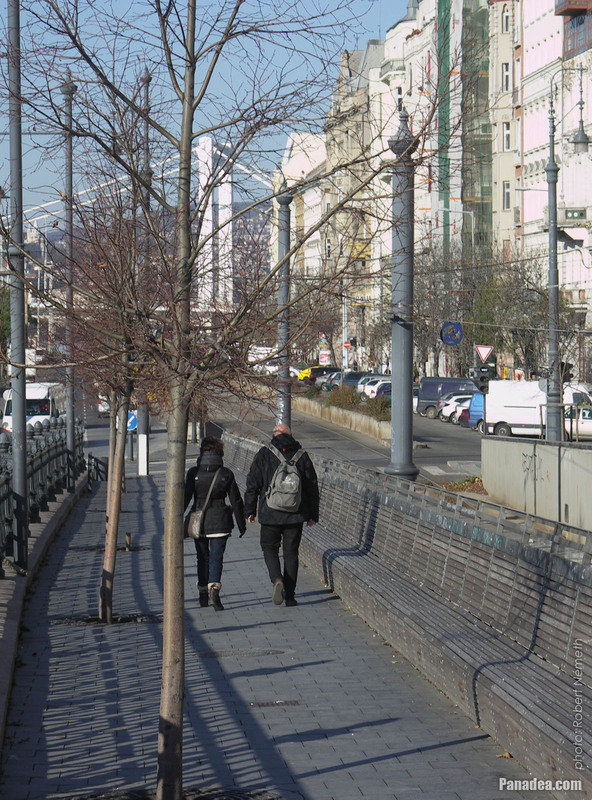 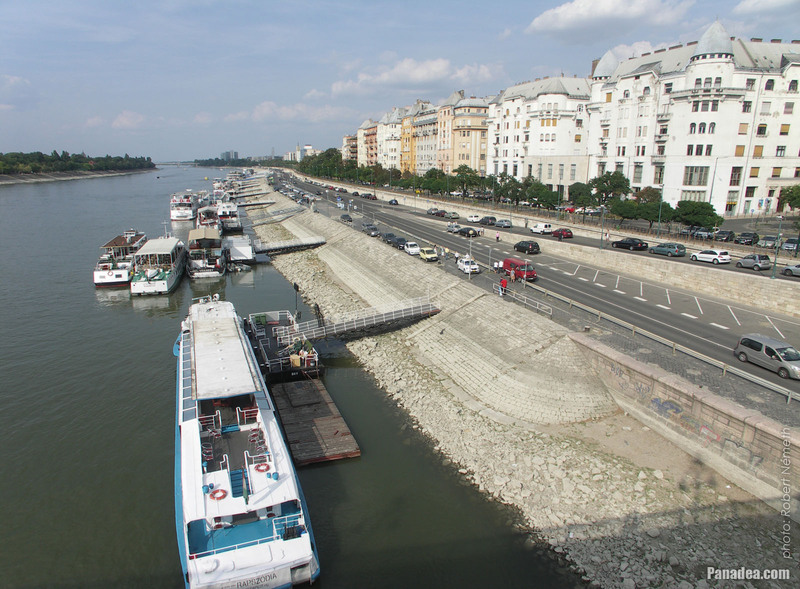 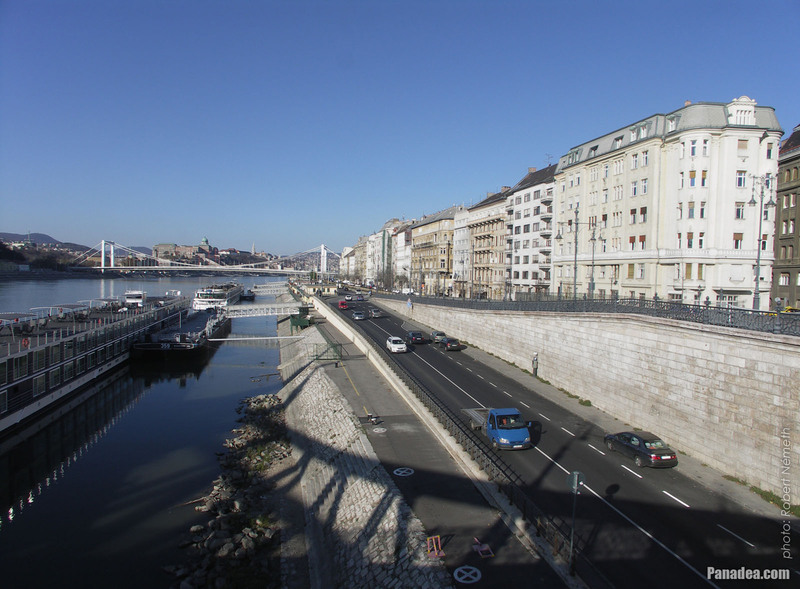 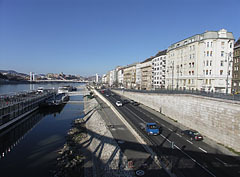 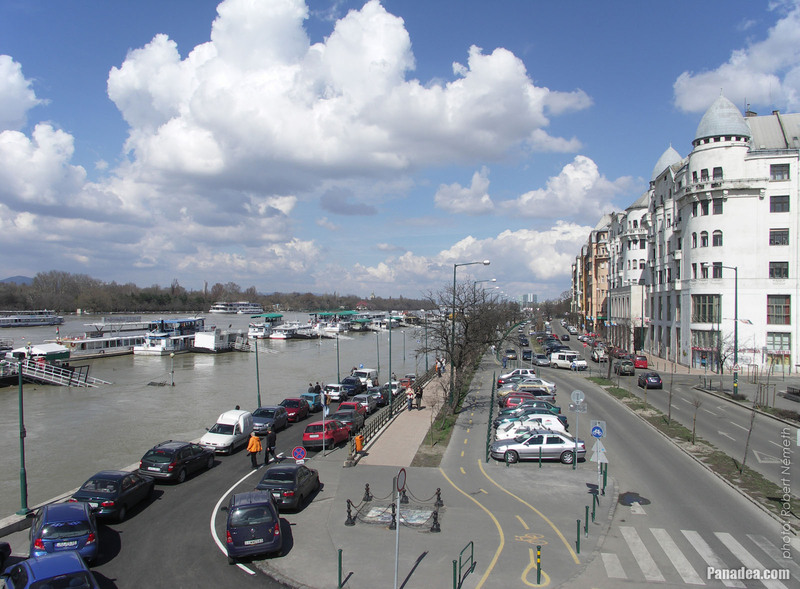 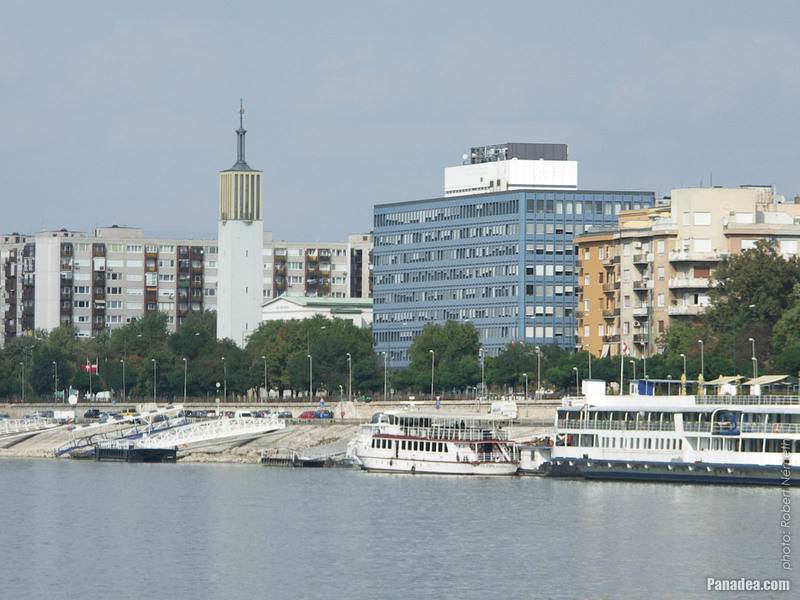 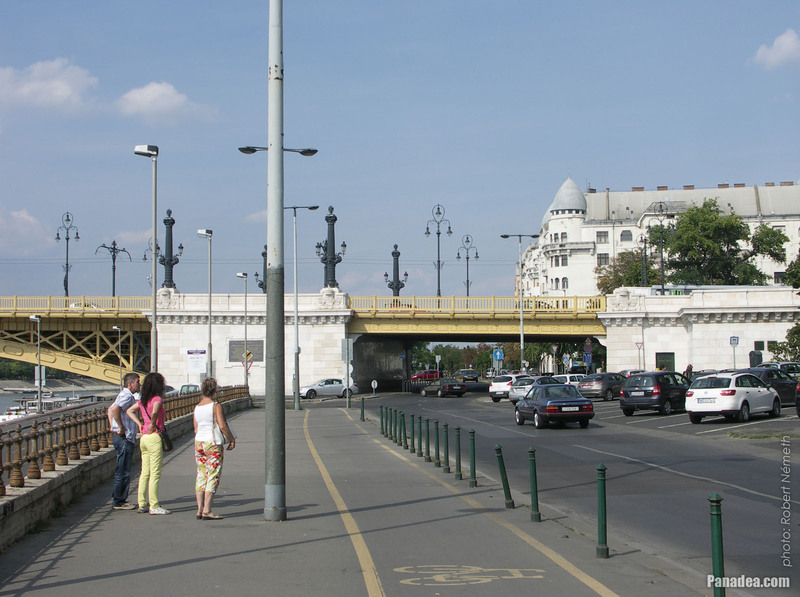 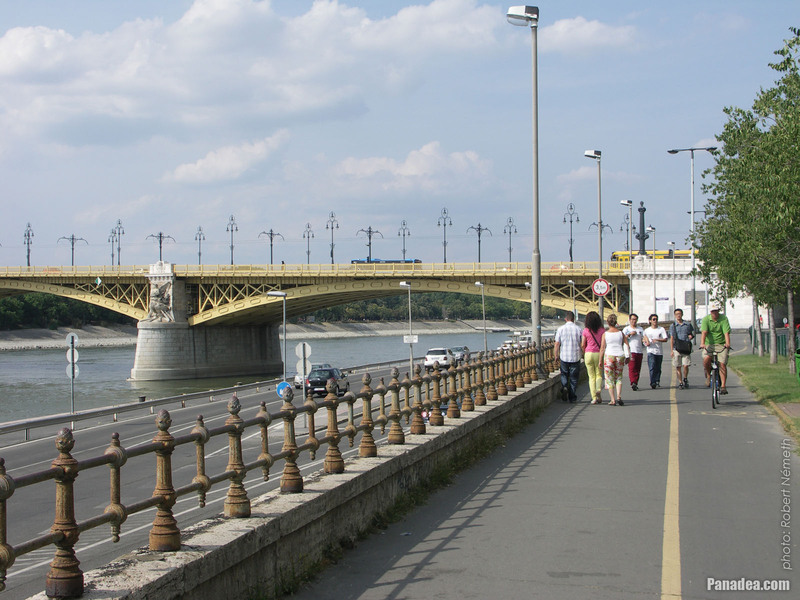 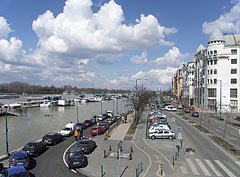 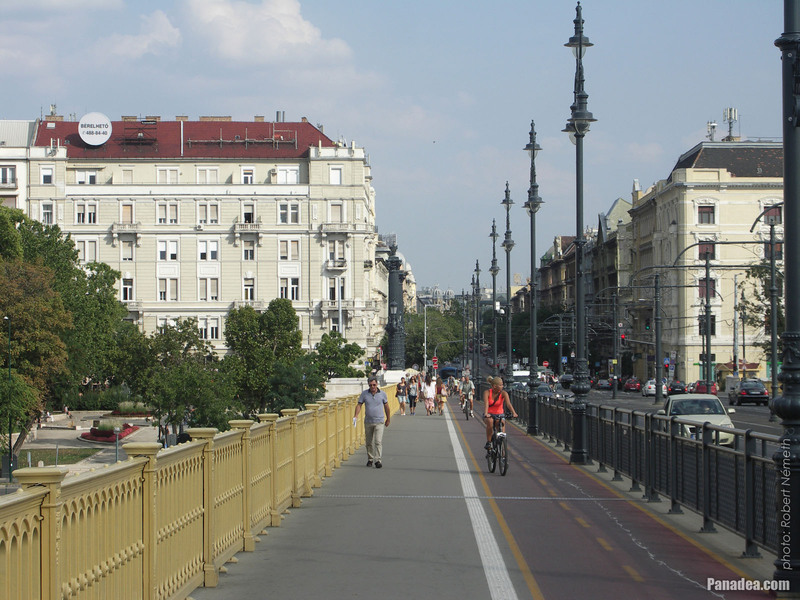 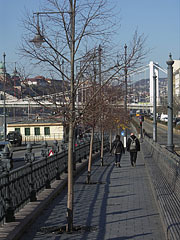 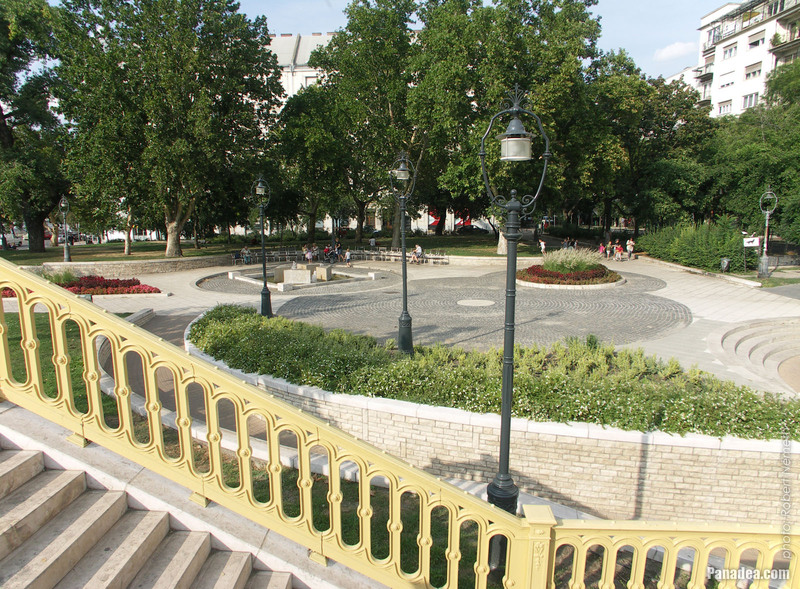 The present Danube promenade (in Hungarian "Duna-korzó") was evolved from an alley that was situated next to the Inner City Parish Church about 200 years ago. 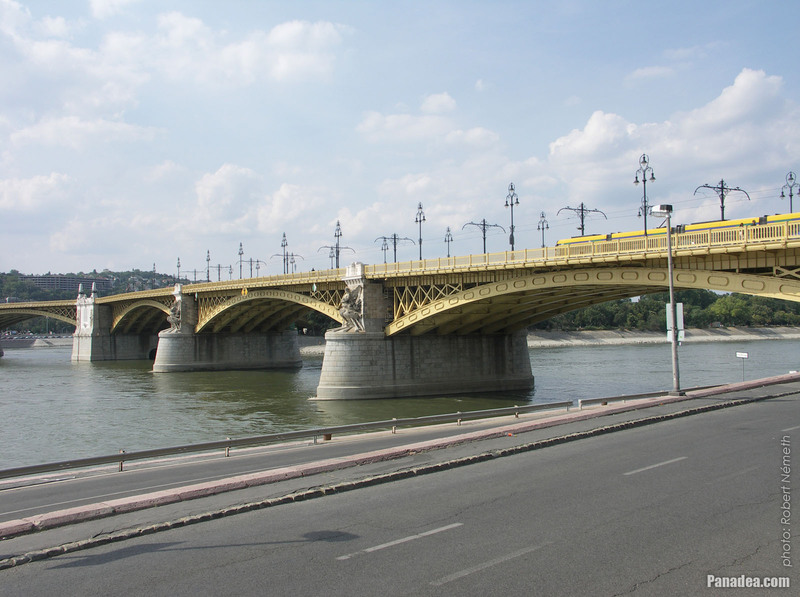 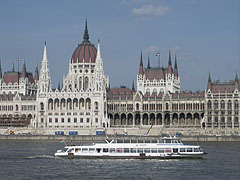 Its current location and character was created at the time of the Hungarian Millenium, in 1896. 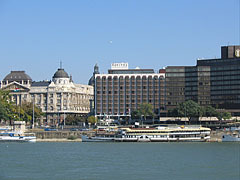 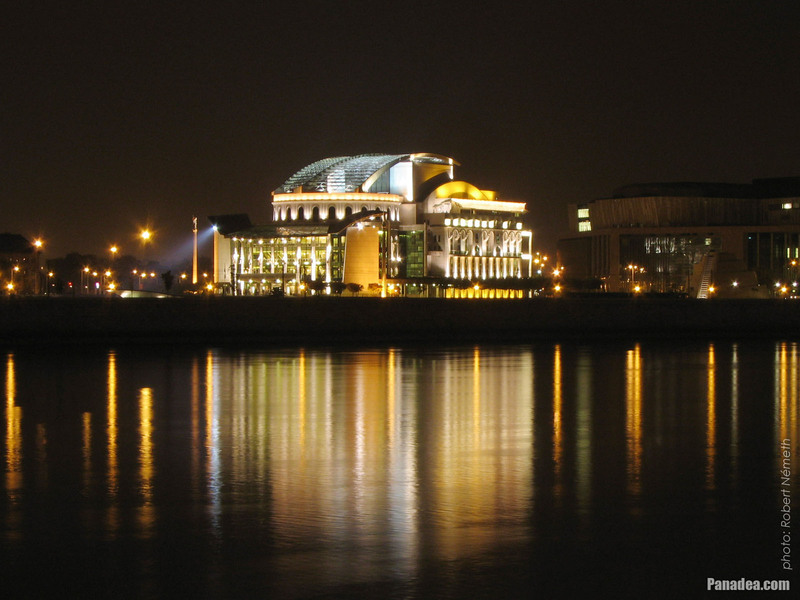 Beside the theater on the right a part of the Palace of Arts ("Művészetek Palotája" or "Müpa") cultural event center can be seen. 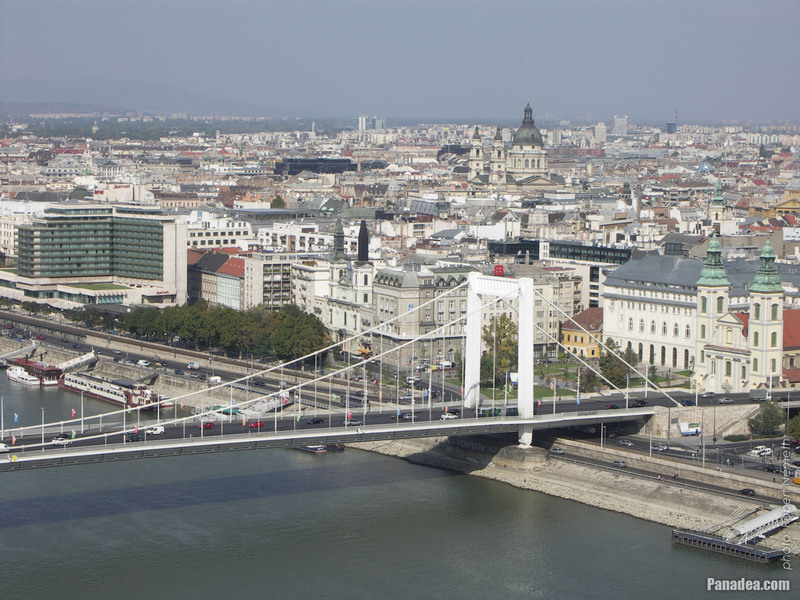 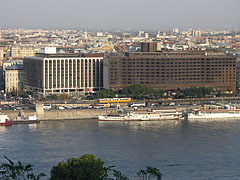 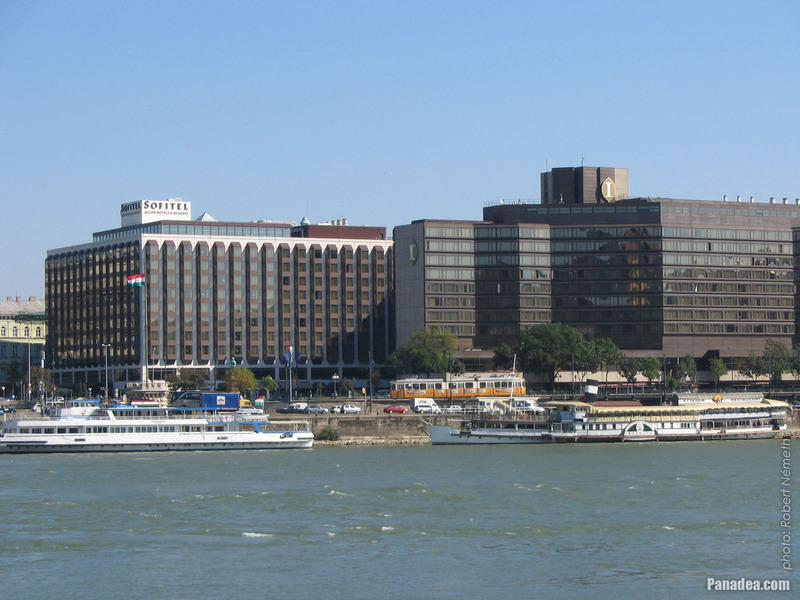 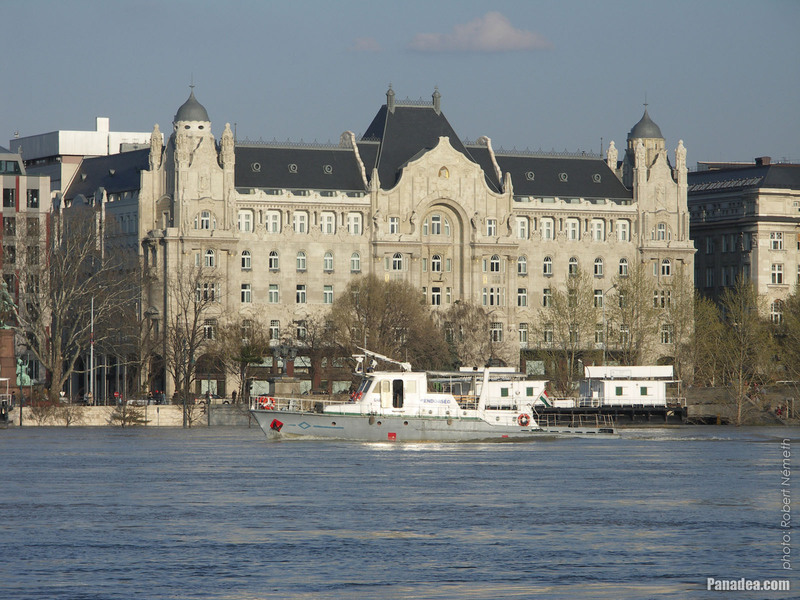 The palace of the Ministry of Interior ("Belügyminisztérium"), as well as two five-star hotels also can be seen: the Sofitel Hotel Budapest Chain Bridge (former Hotel Atrium Hyatt) and the InterContinental Hotel Budapest. 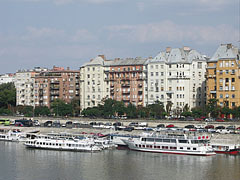 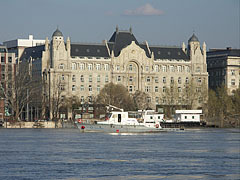 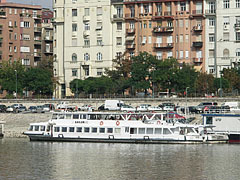 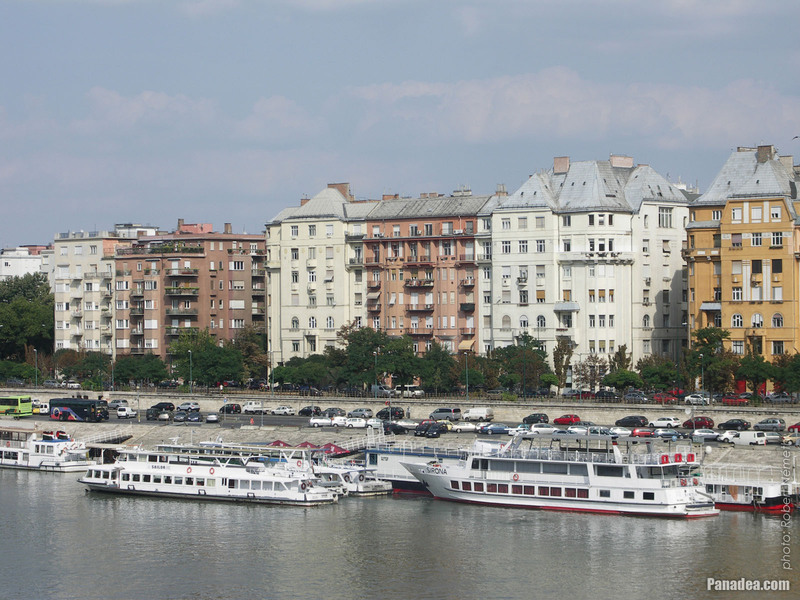 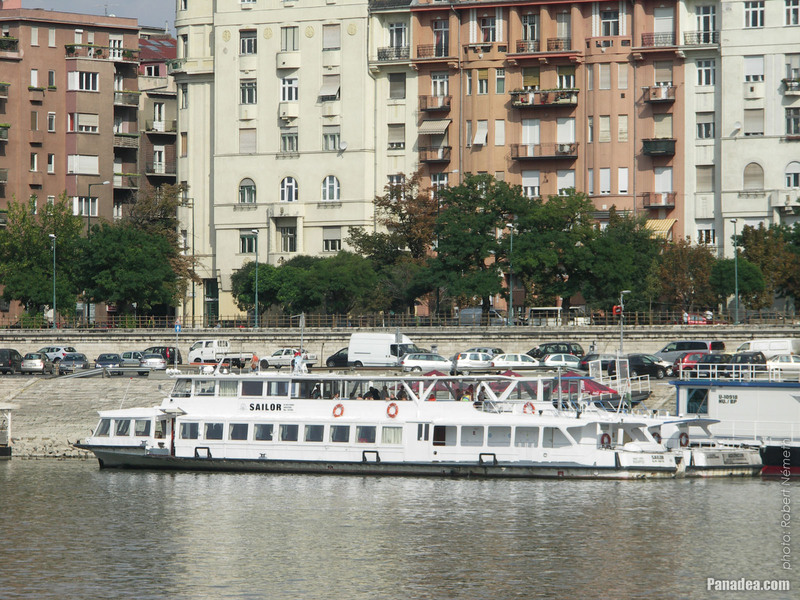 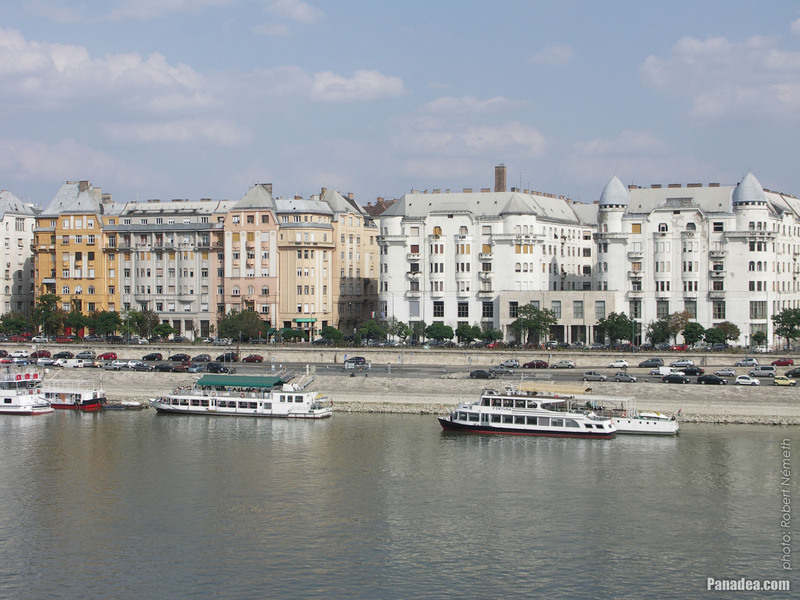 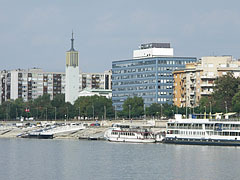 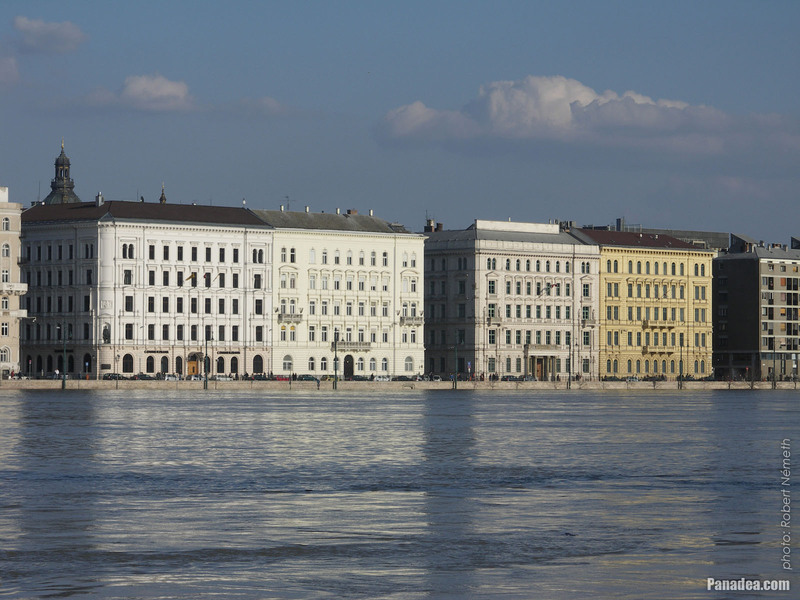 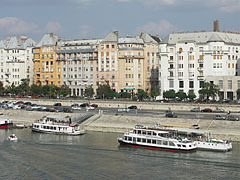 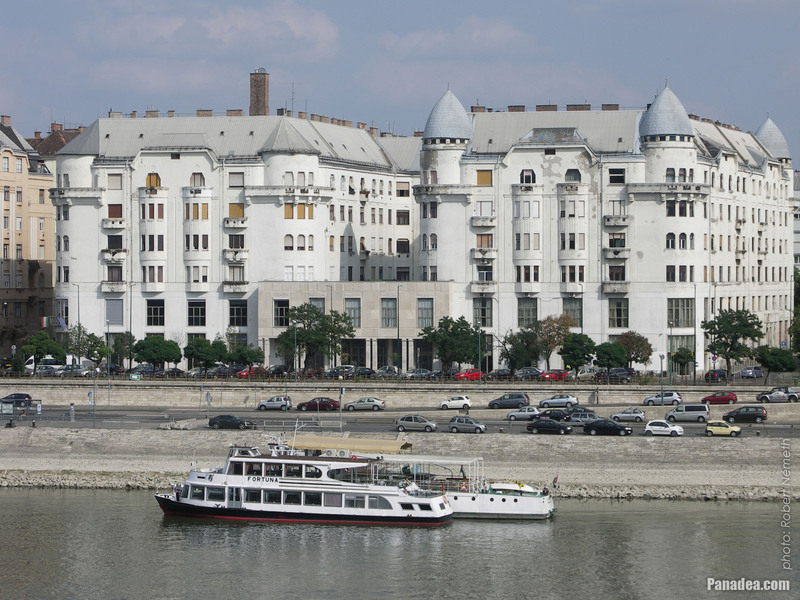 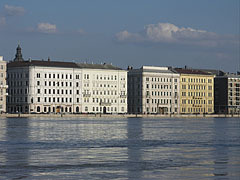 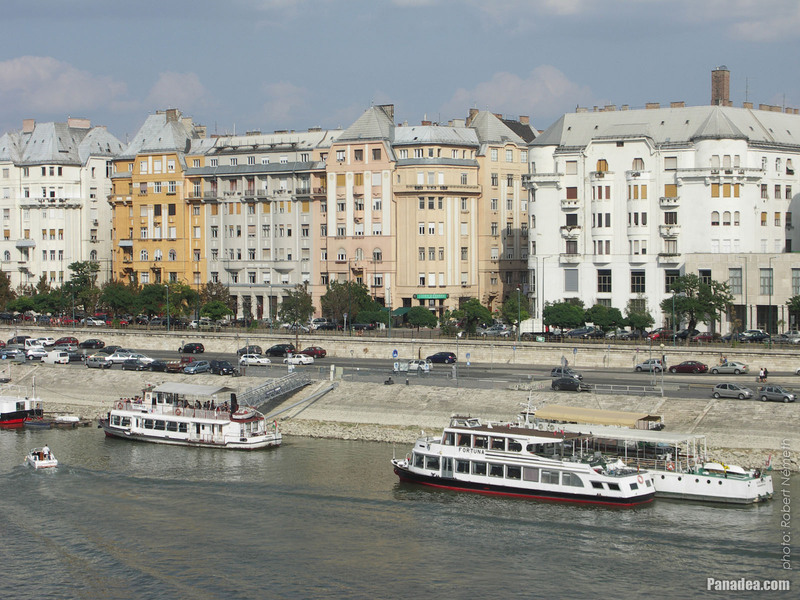 Five-story waterfront residental buildings in Pest downtown, on the riverbank of the Danube. 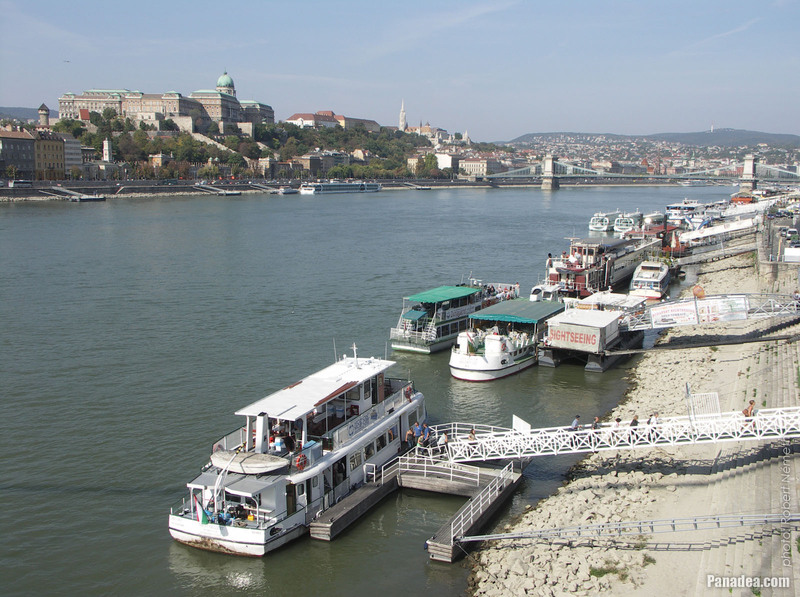 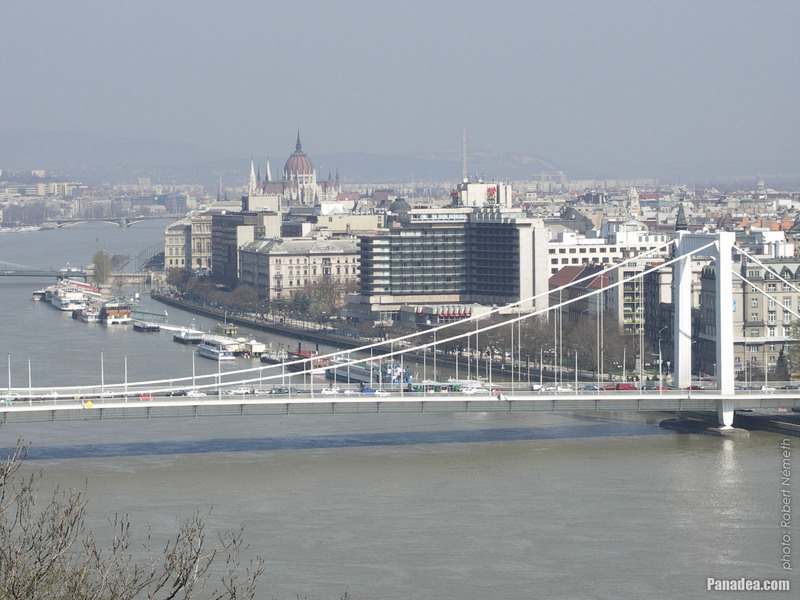 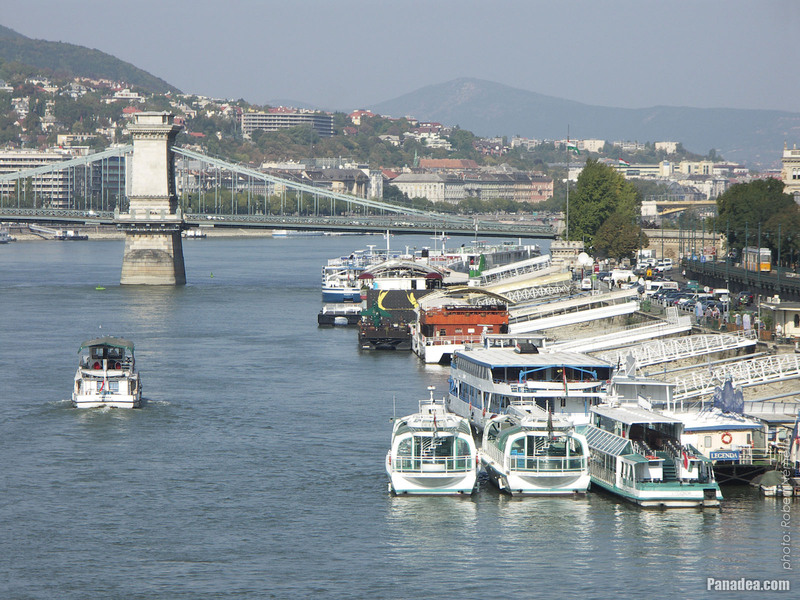 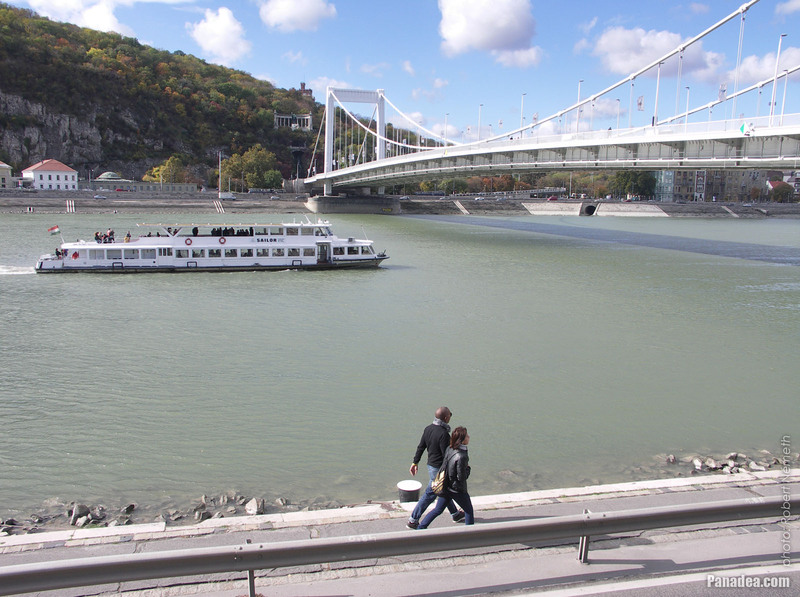 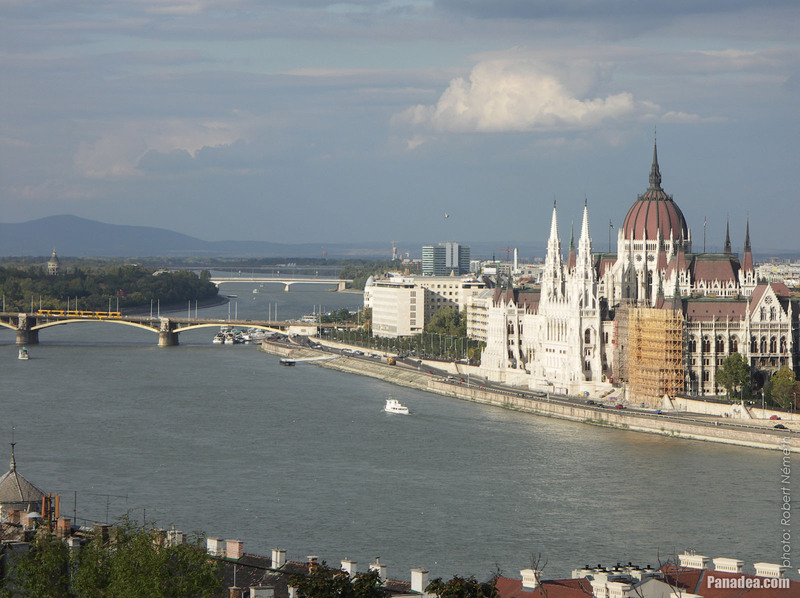 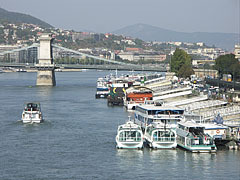 The panorama of the riverbanks of Danube at Budapest is a UNESCO World Heritage site. 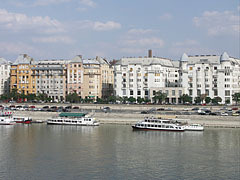 On the right the so-called "Palatinus" apartment buildings can be seen. 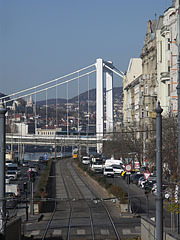 As well as the Elisabeth Bridge in the distance. 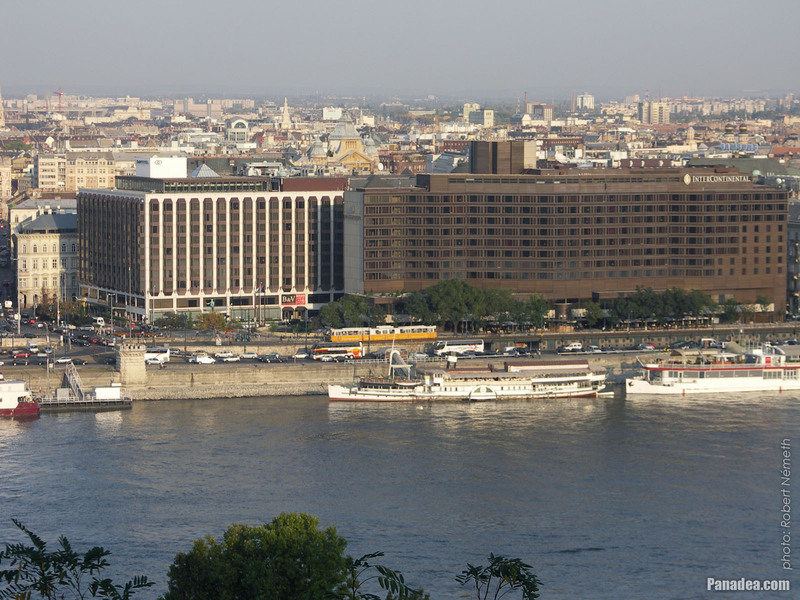 The hotel was built between 1966-1969, designed by József Finta Hungarian architect (who was born in Kolozsvár/Cluj-Napoca, Transylvania, Romania in 1935). 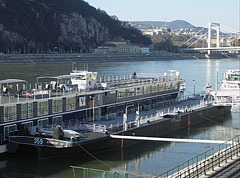 It was built in Újpest (Budapest, Hungary) in 1963, a little earlier than its sister boats, the "Rákóczi" and the "Hunyadi". 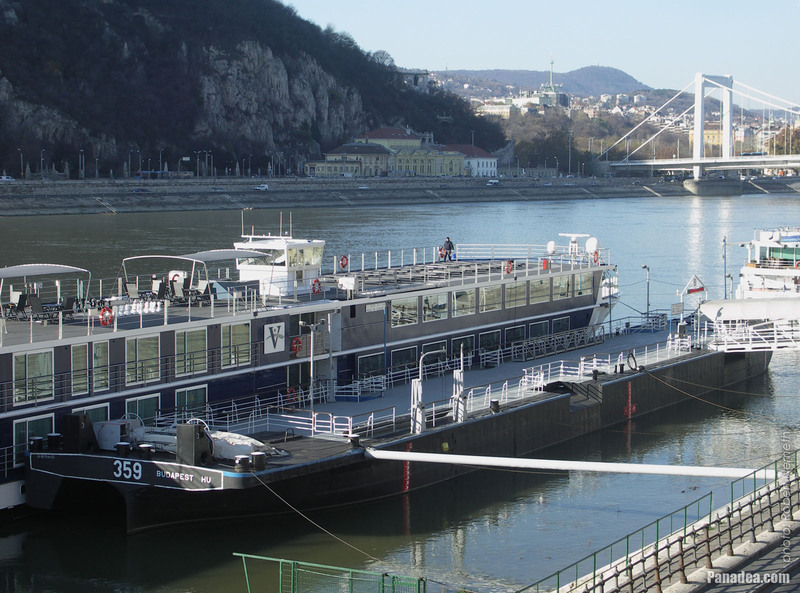 The main parameters of borht three riverboats are the same: 57 meters in length, 400 persons in capacity, top speed of 22 km/h and draught (or draft) of 1.55 meters. 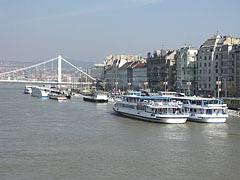 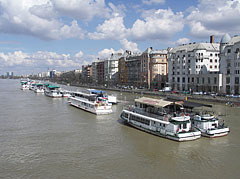 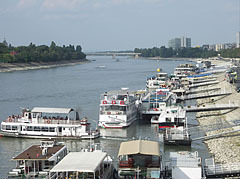 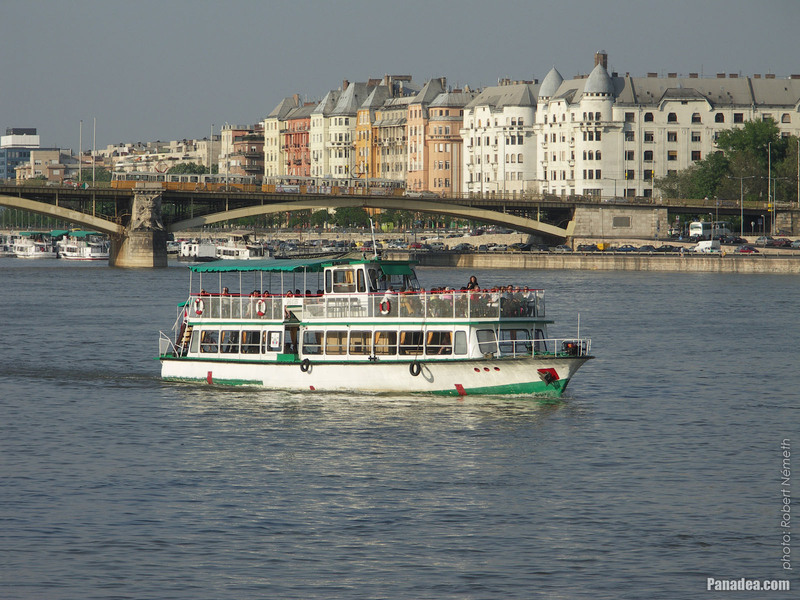 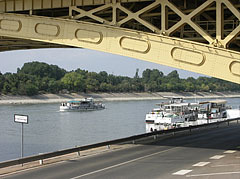 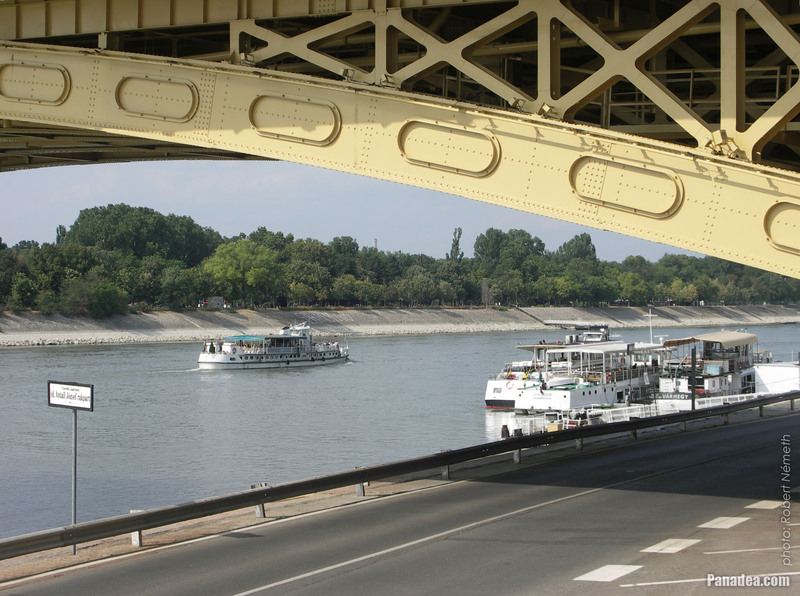 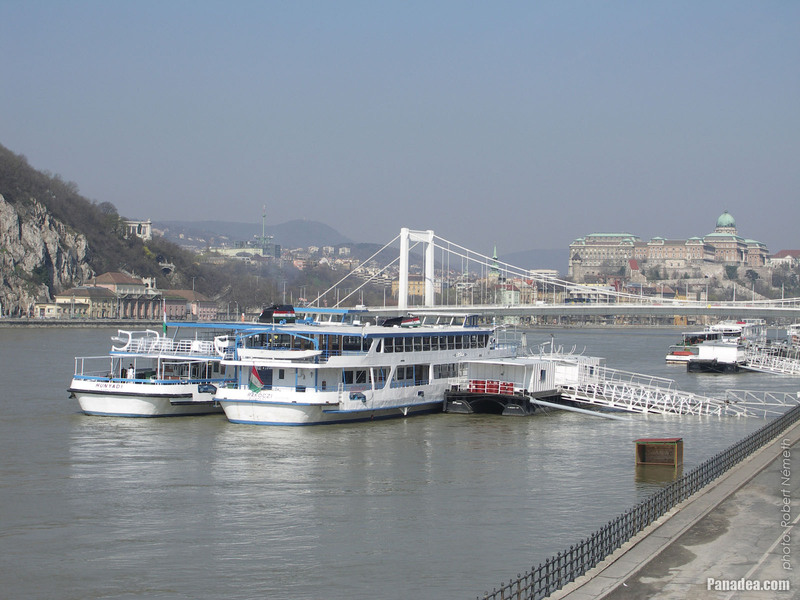 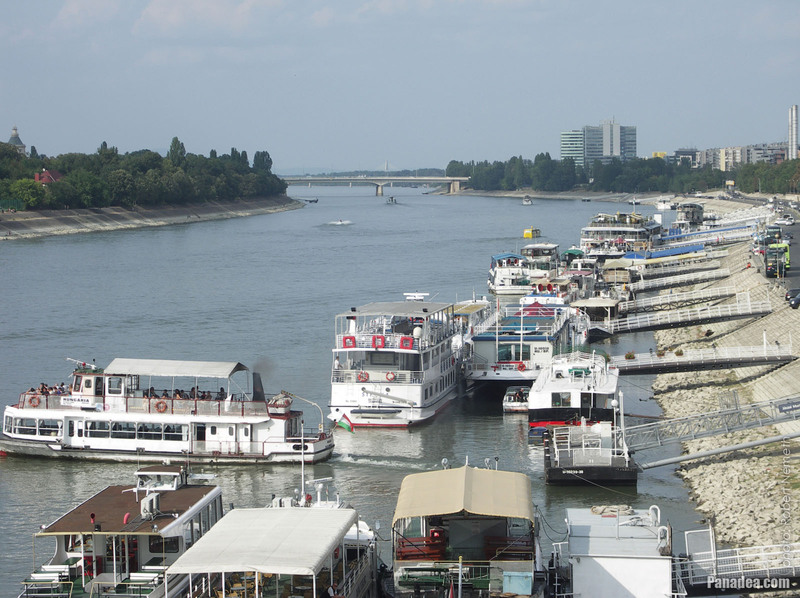 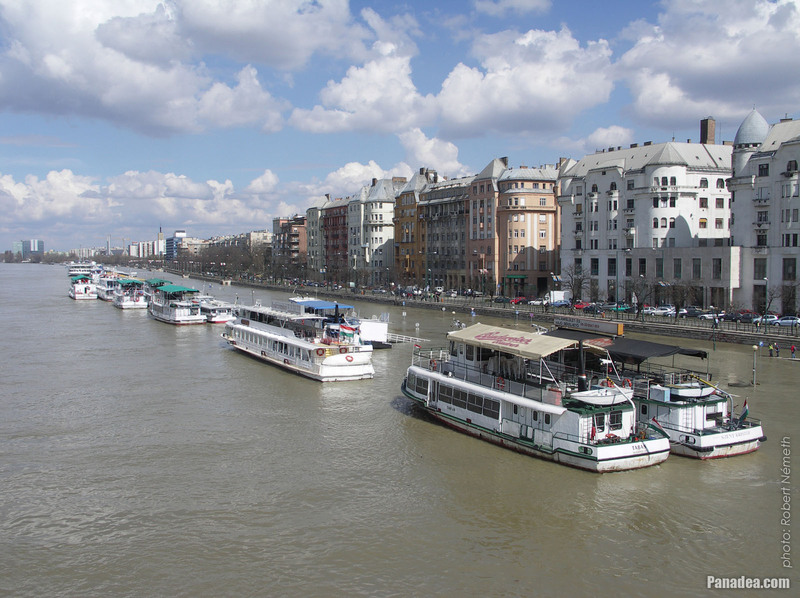 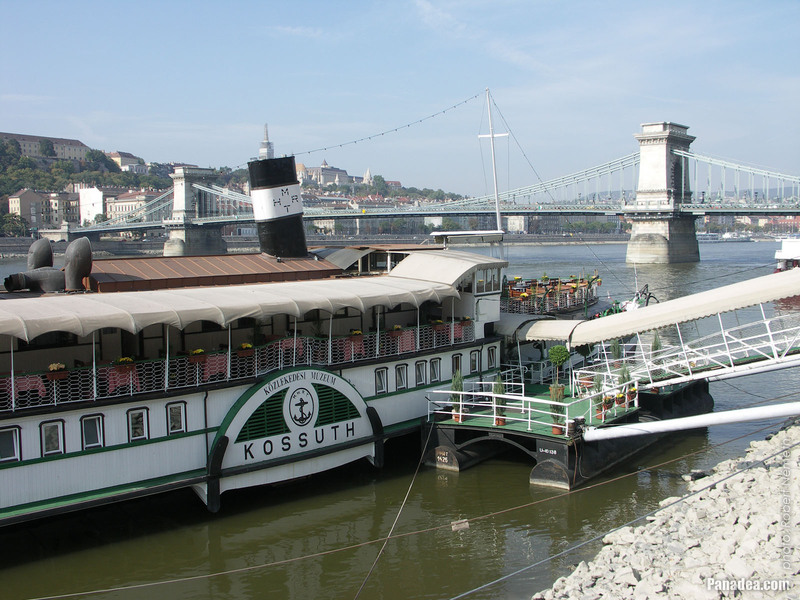 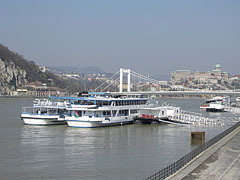 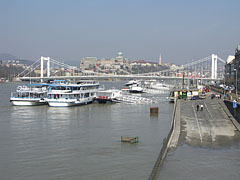 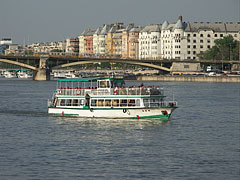 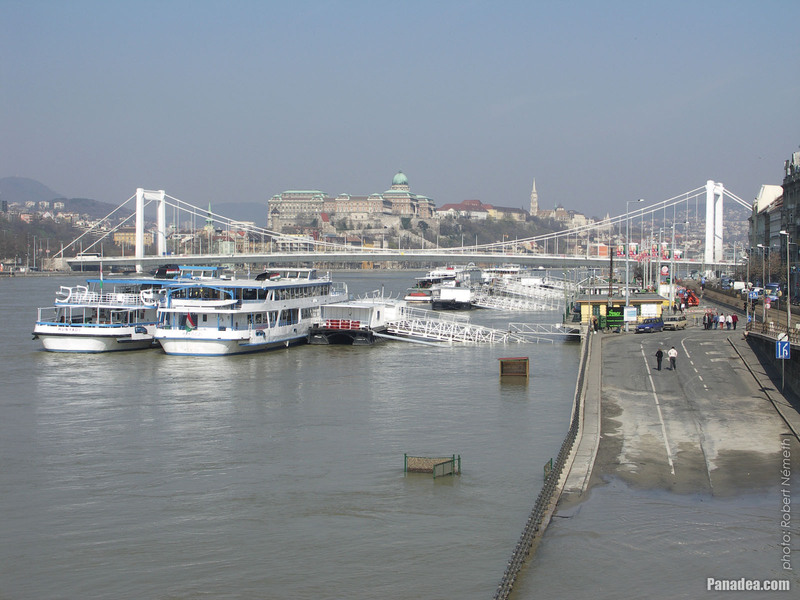 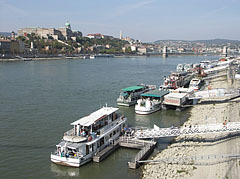 The boats are operated on the Danube by the MAHART, and then the MAHART Passnave companies. 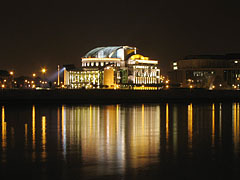 The approx. 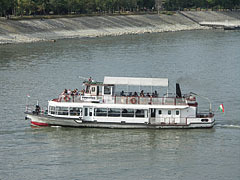 53-meter-long riverboat was constructed in Giessendam, Netherlands in 1988 and initially it was called "Eureka II". 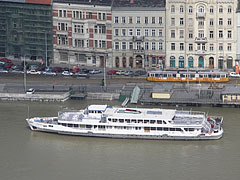 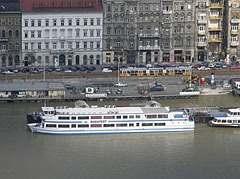 In 1994 the boat was acquired by the MAHART Passnave company and moved to Hungary. 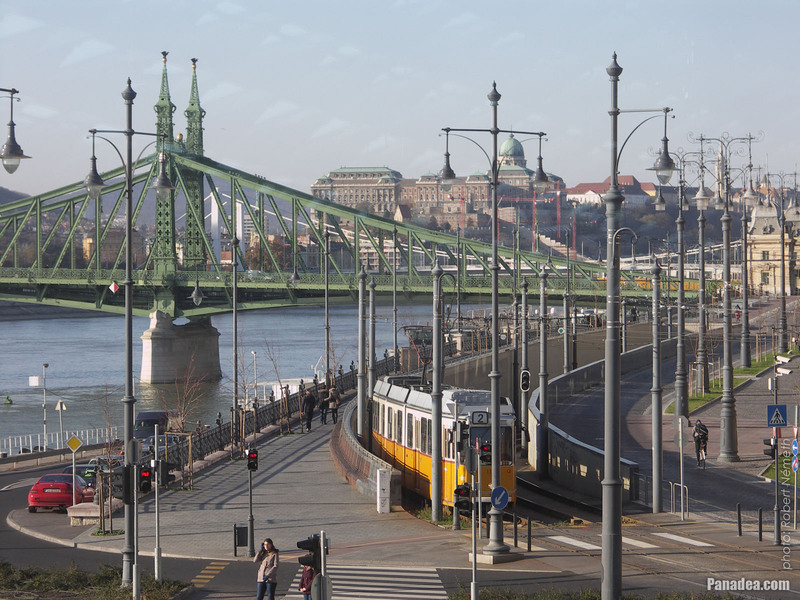 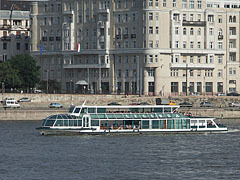 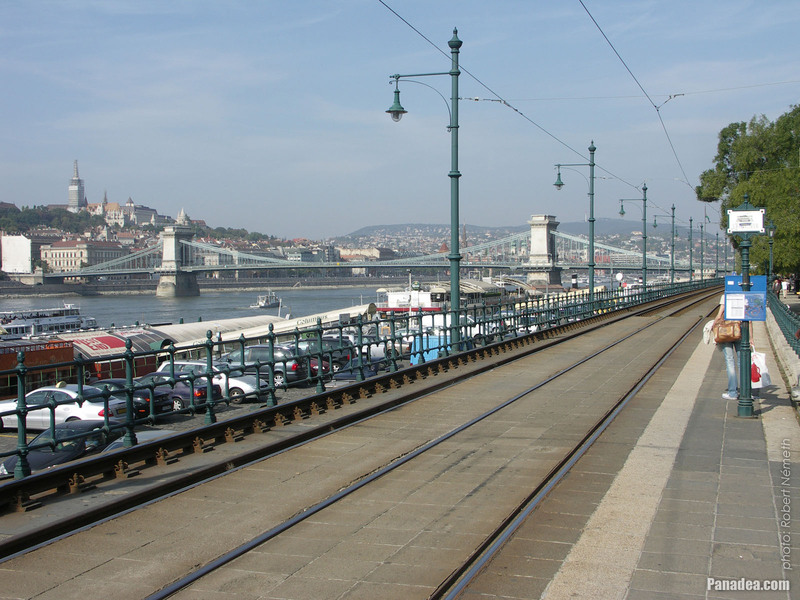 Since then it is called "Budapest" and operating on the Danube River. 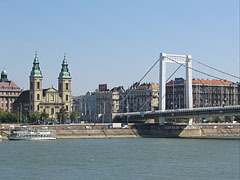 In the middle of the picture the steeple (tower) of the Downtown Franciscan Church can be seen (the church is on the "Ferenciek tere" square). The two sister boats were built in Újpest (Budapest, Hungary) in 1964 and 1966. 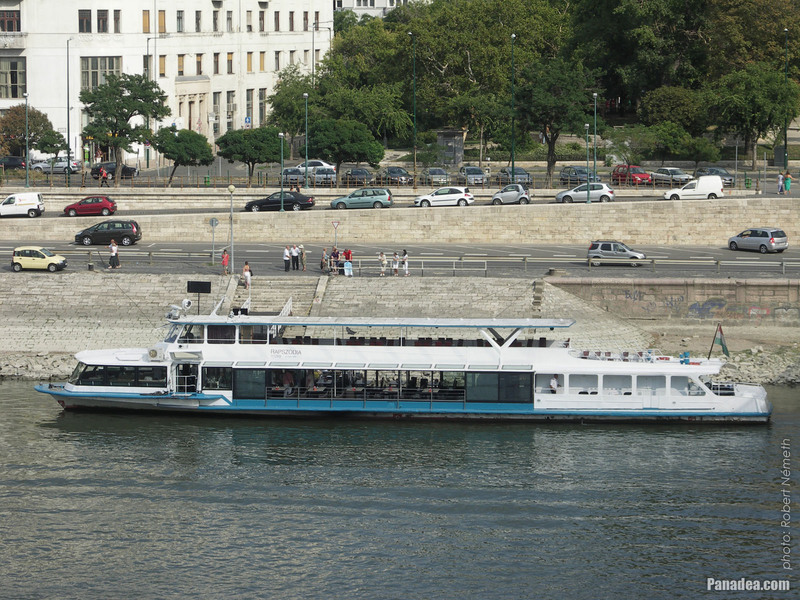 Both are 57 meters in length and both have the capacity of 400 persons. 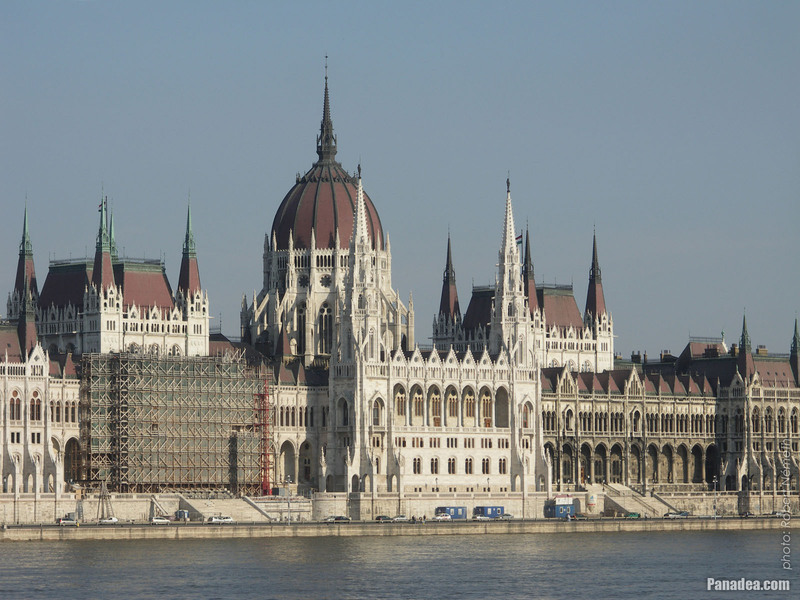 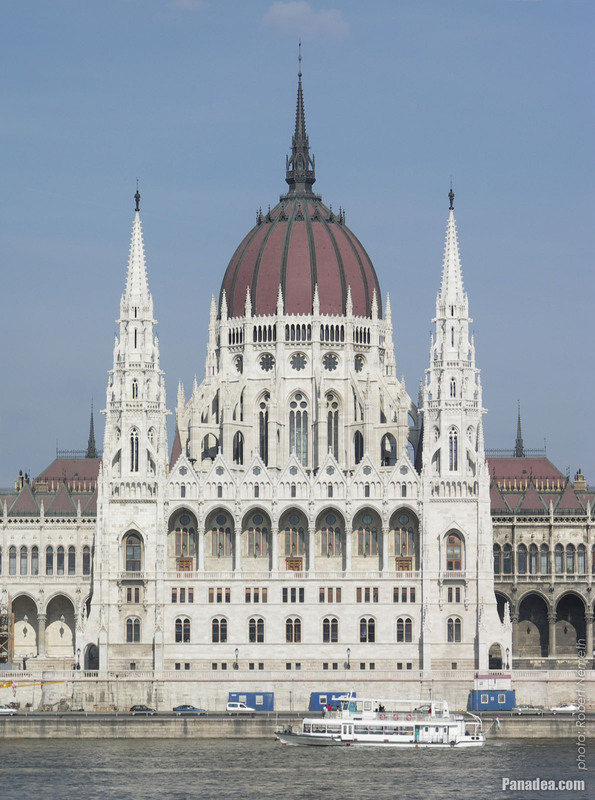 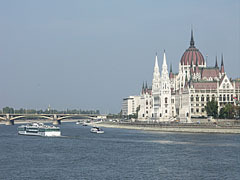 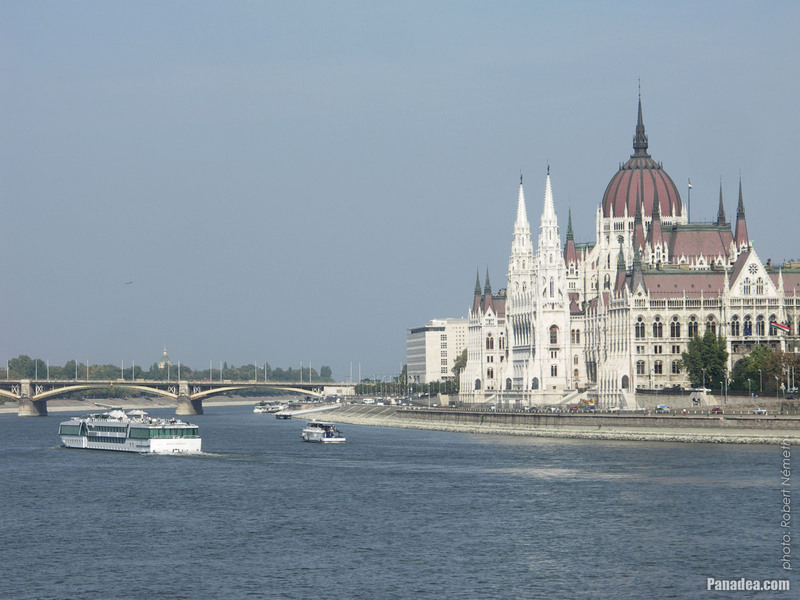 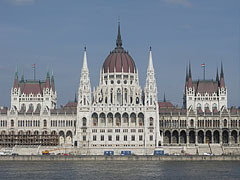 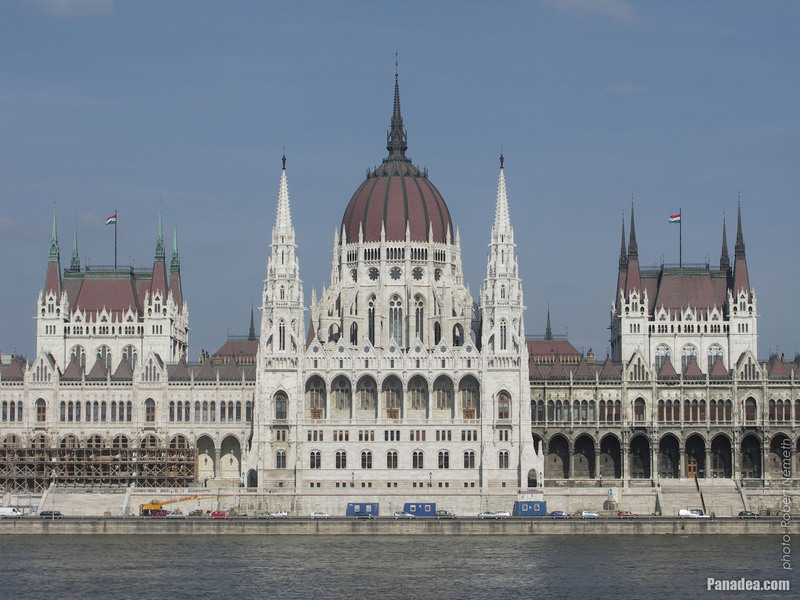 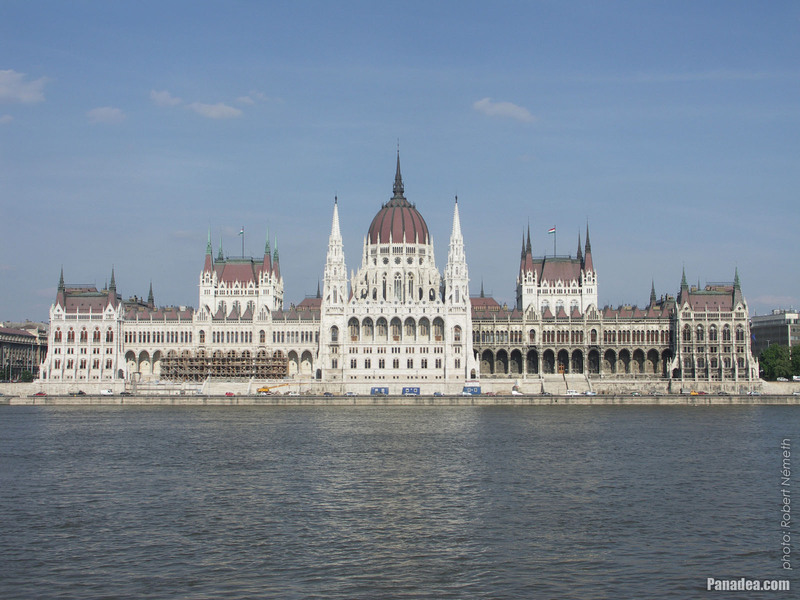 The historicist (neo-gothic) and eclectic style Hungarian Parliament Building ("Országház") was designed by the Hungarian architect Imre Steindl, considering its details the dominant style is the neo-gothic. 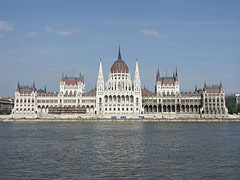 It was built between 1885 and 1904, and it was a criterion to use only domestic building materials. 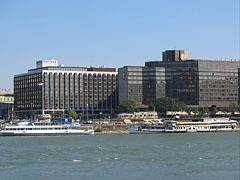 The architect Imre Steindl was died before the building was completed.